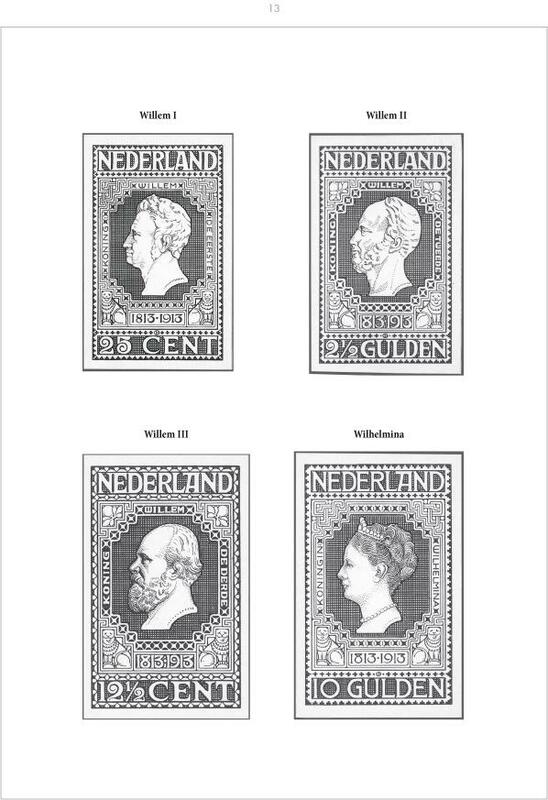 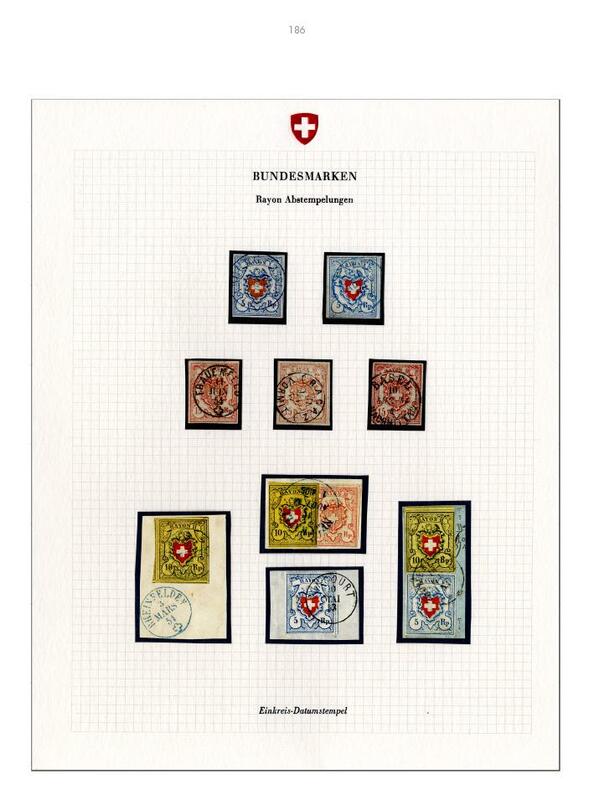 For important collections of the highest international standing which have not been exhibited by the collector, an EDITION SPÉCIALE series was created in addition to the EDITION D´OR series. 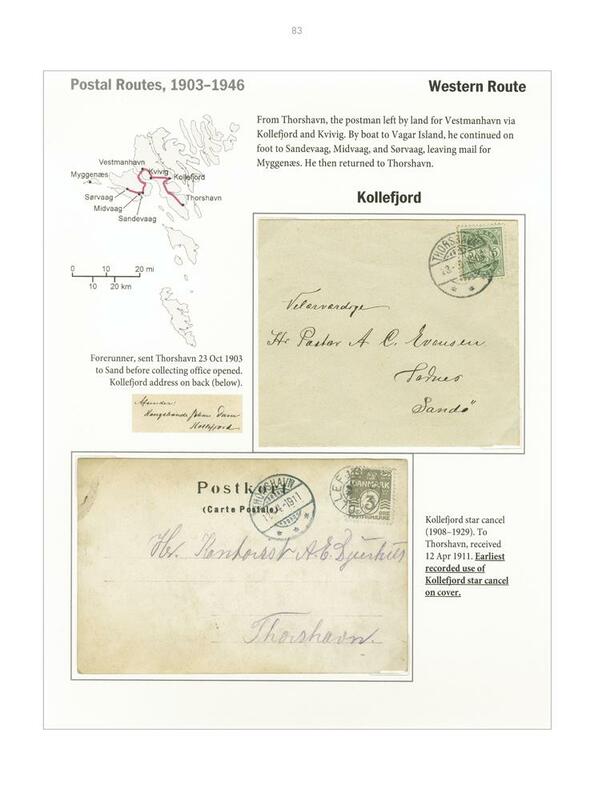 This Kersti and Bertil’s postage due collection is a treasure trove not only for postage due collectors, but also for any one collecting mail to foreign destinations from any other collectible area! 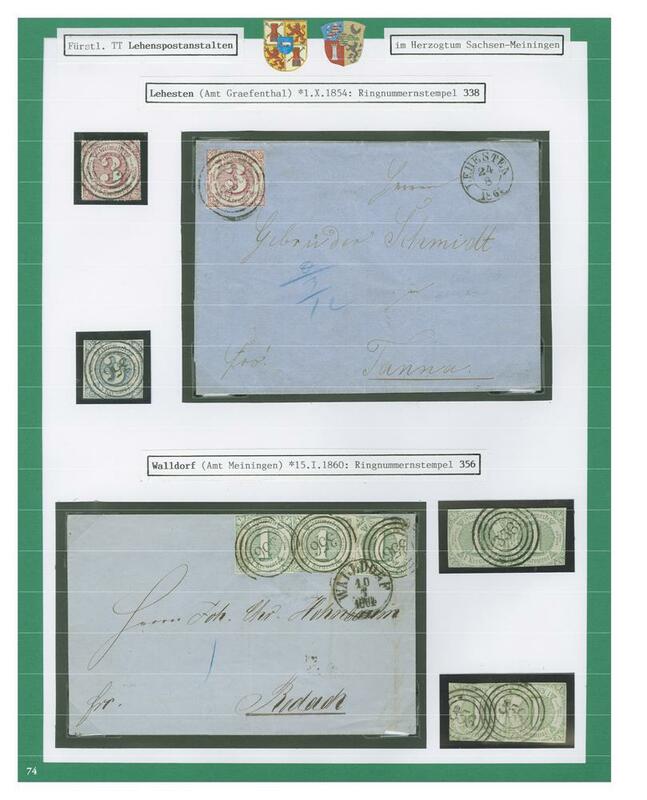 Unbelievable the number of covers from the period when the postage was marked by hand and as impressive the quantity with the postage due marked by postmarks and postage due stamps! 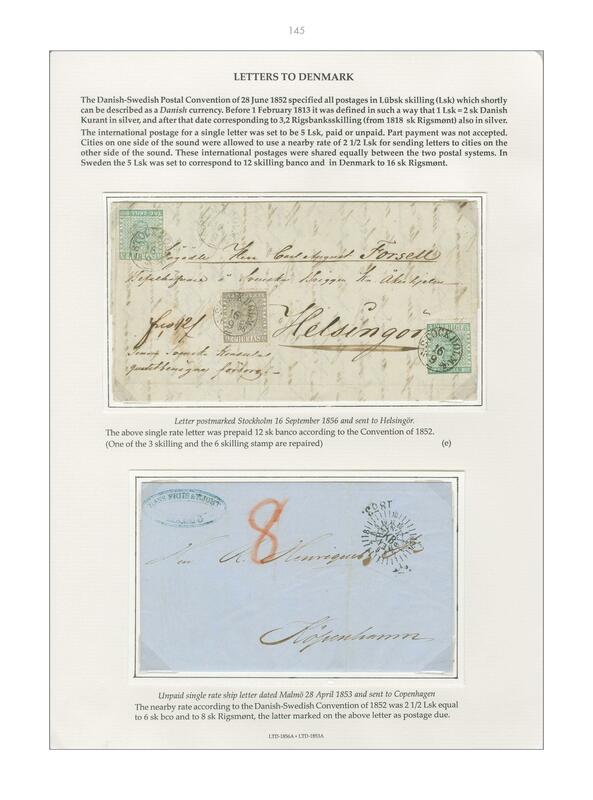 The inland part of this section shows so many very rare and early usages as probably no second collection does! 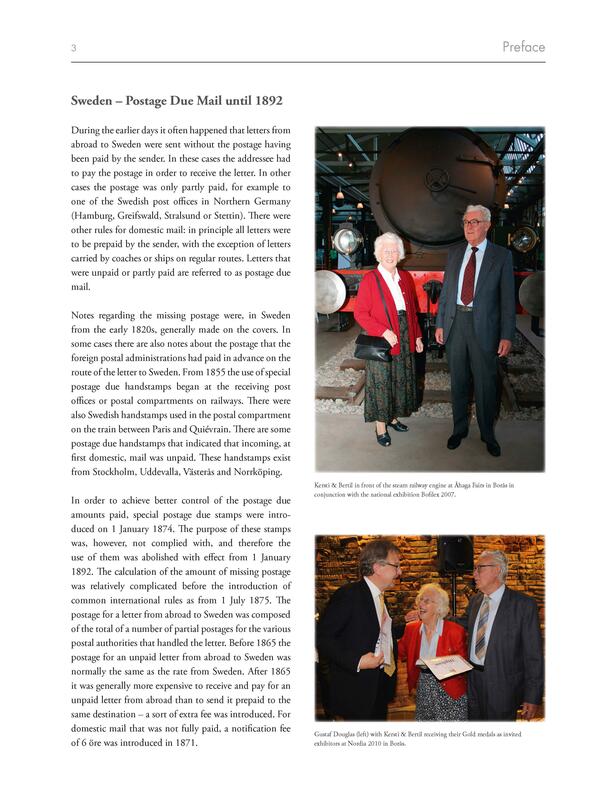 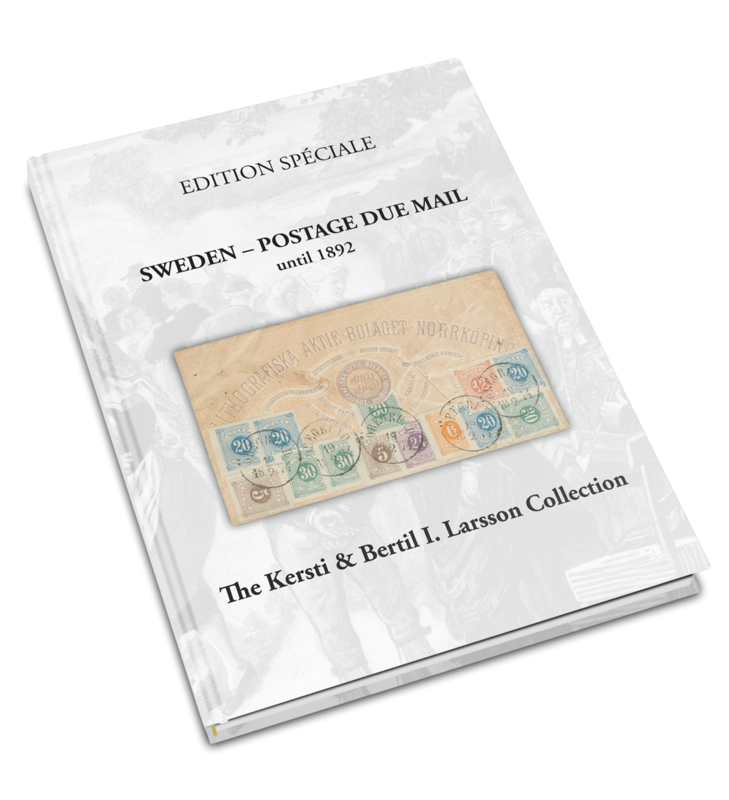 Kersti and Bertil I. Larsson RDP are members of the Swedish Postal History Society (SSPD) since decades. 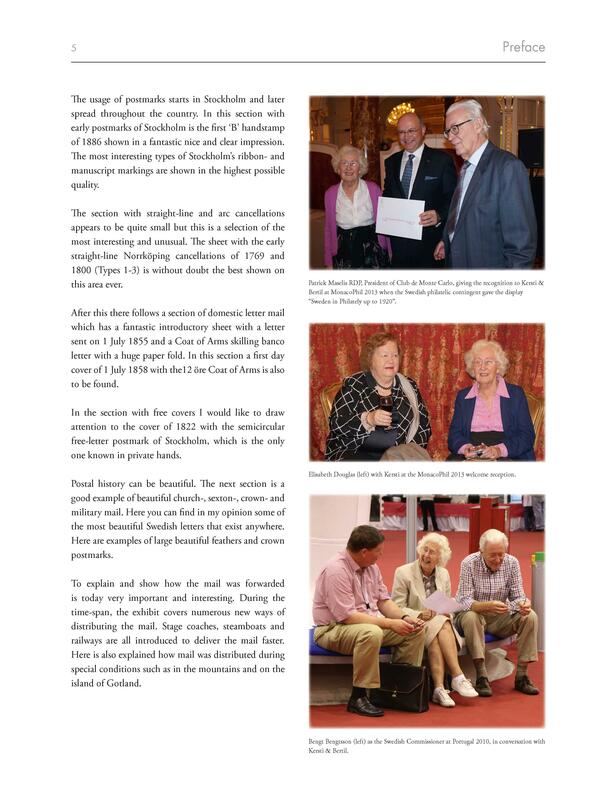 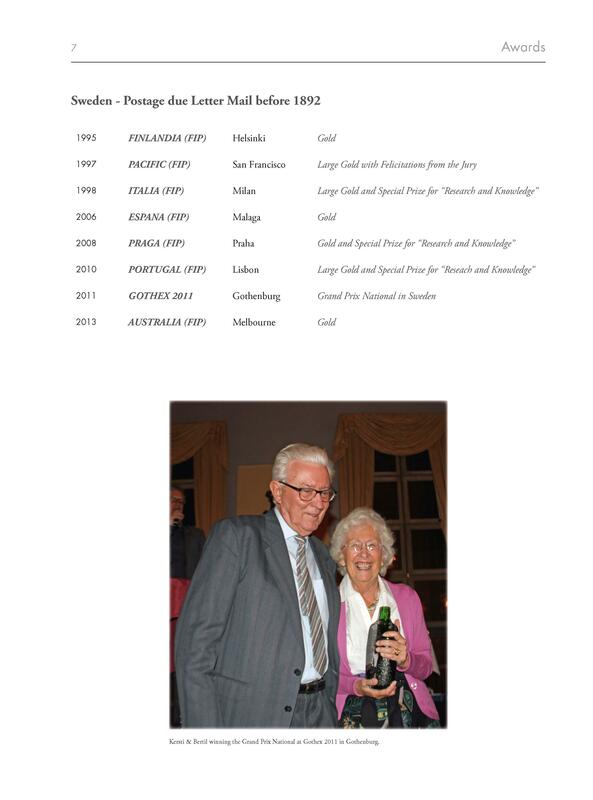 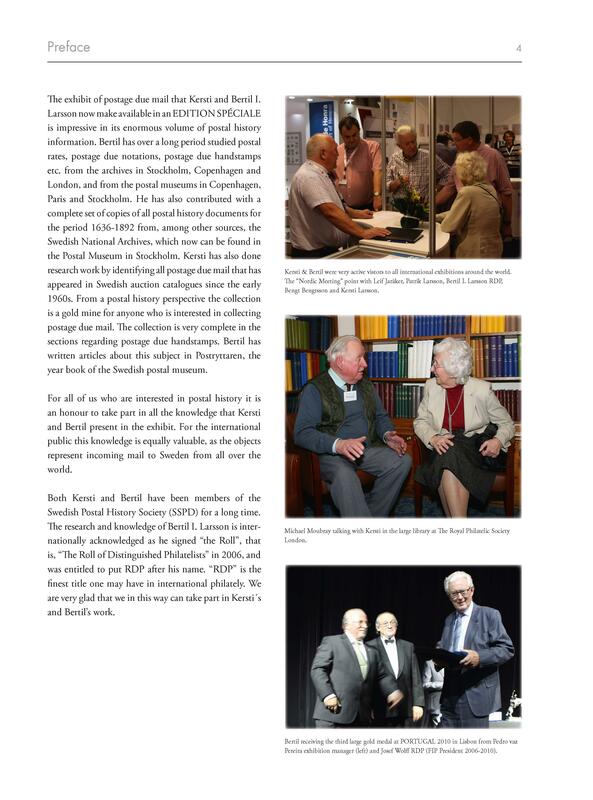 Their research and knowledge is internationally acknowledged and Bertil is signatory of the Roll of Distinguished Philatelists (RDP), the most important and honourable award a philatelist can receive in life. 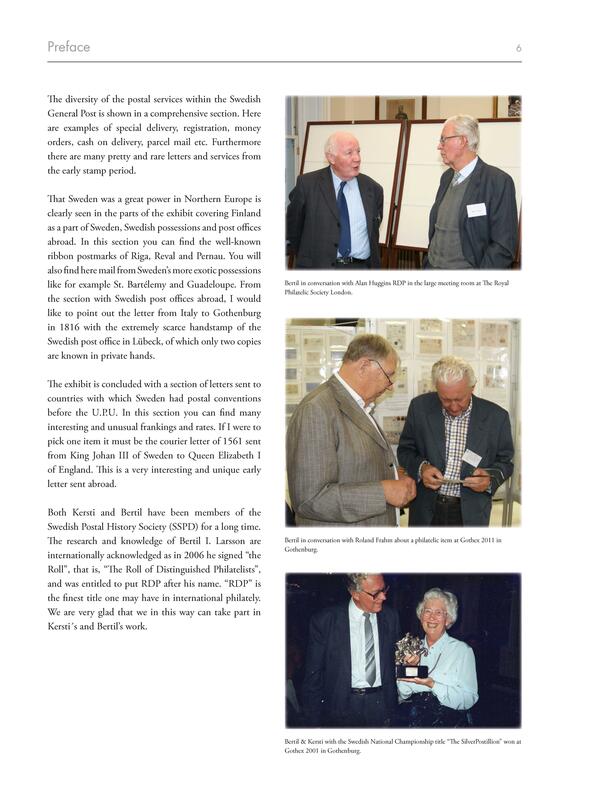 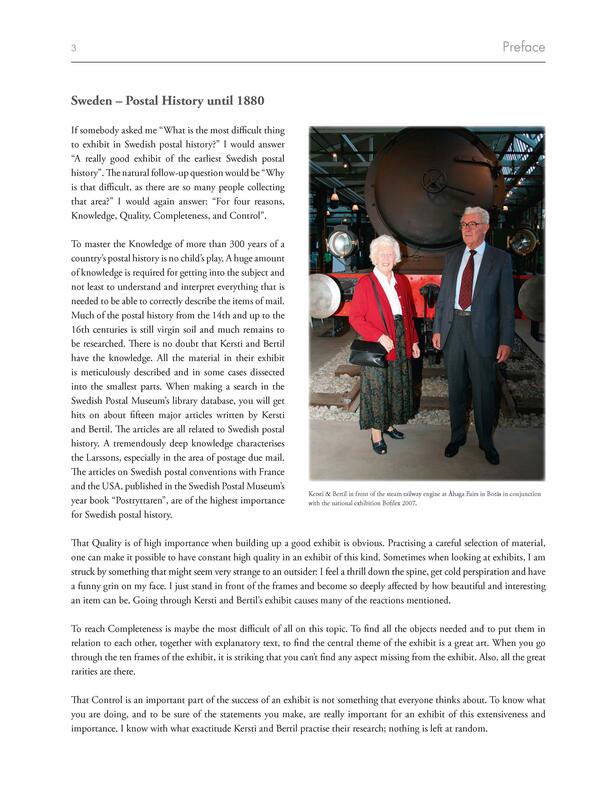 As a team, Kersti and Bertil have share their knowledge with the entire philatelic world by publishing articles in philatelic publications. 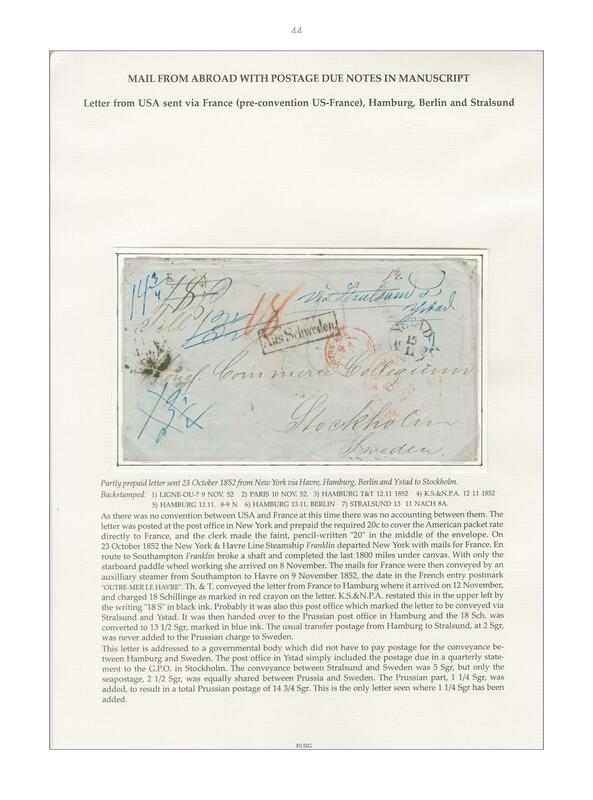 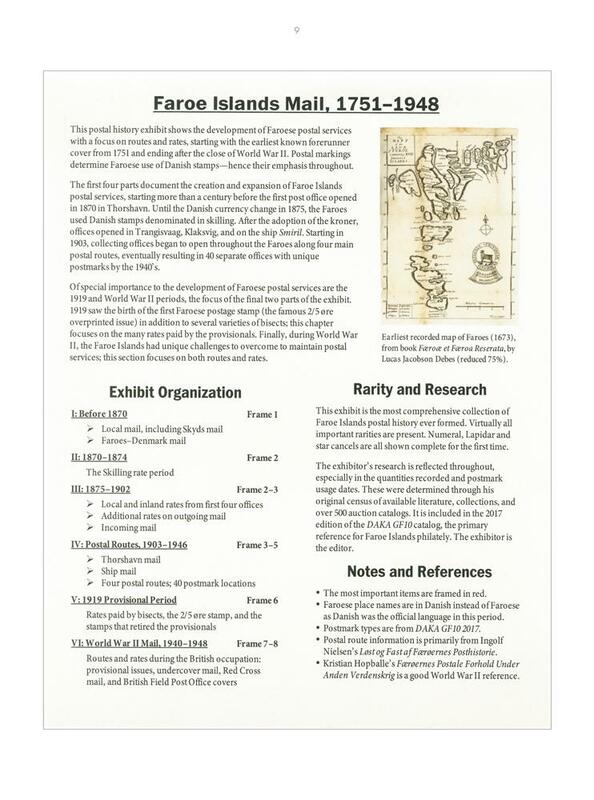 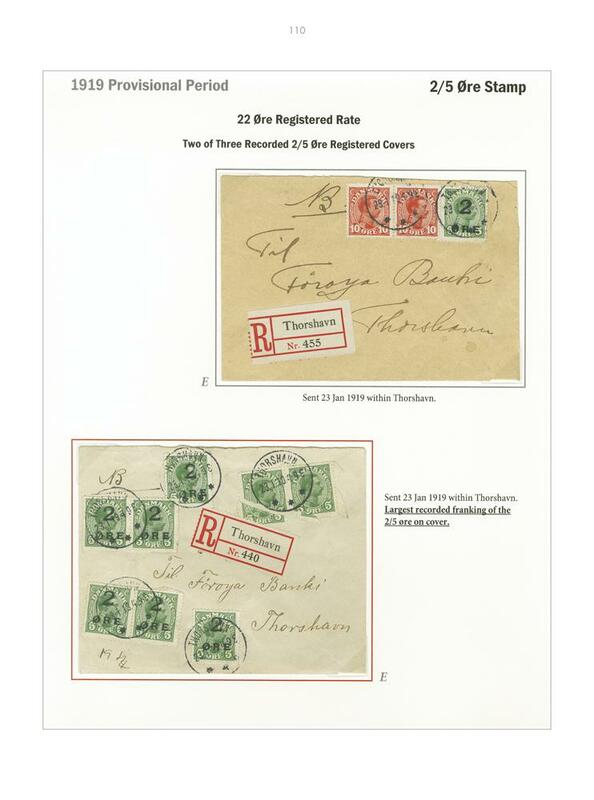 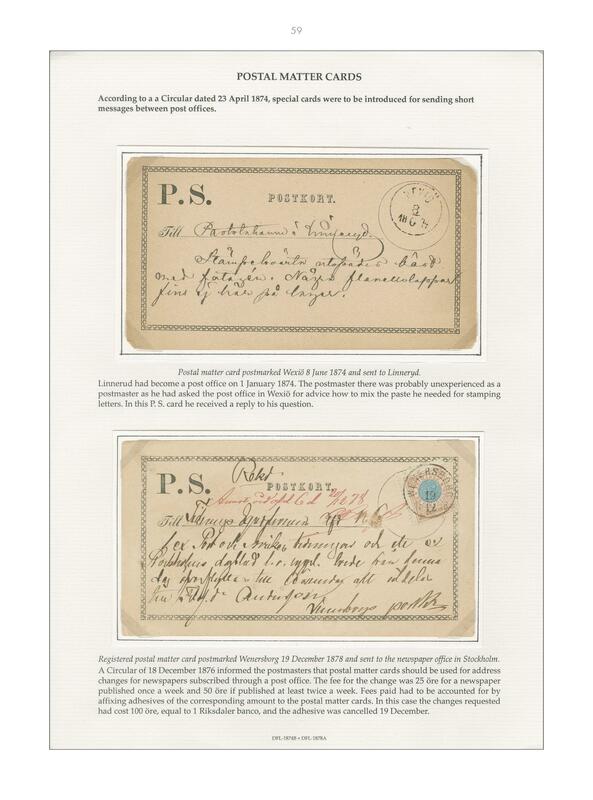 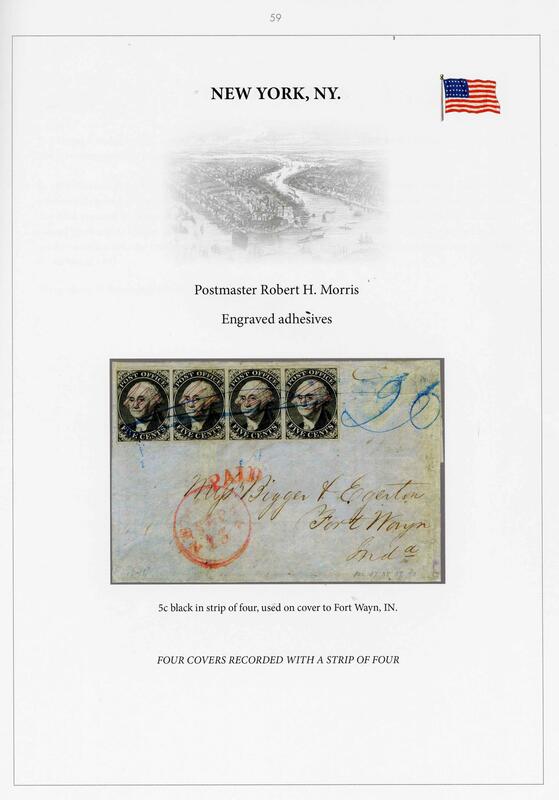 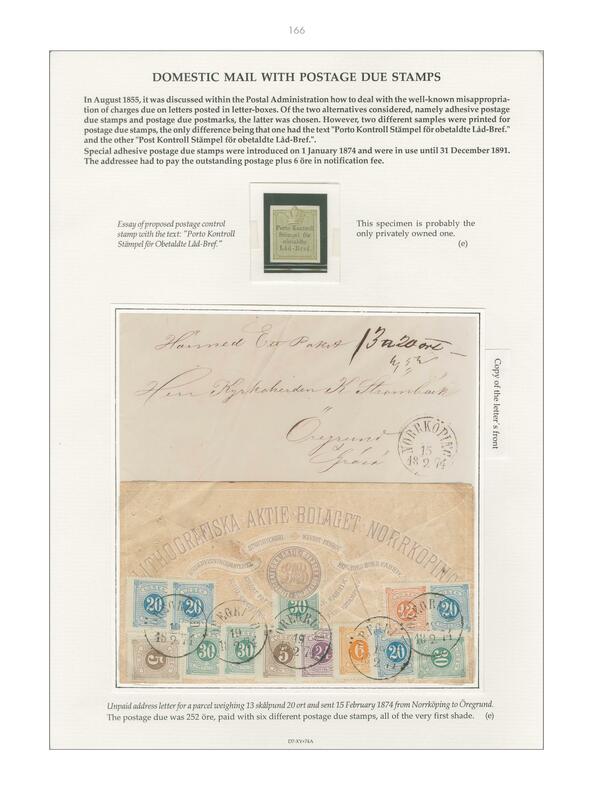 Their outstanding and extremely well written up exhibits are a source of information not only for collectors of Swedish postal history, but also for passionate collectors of all philatelic collectible fields. 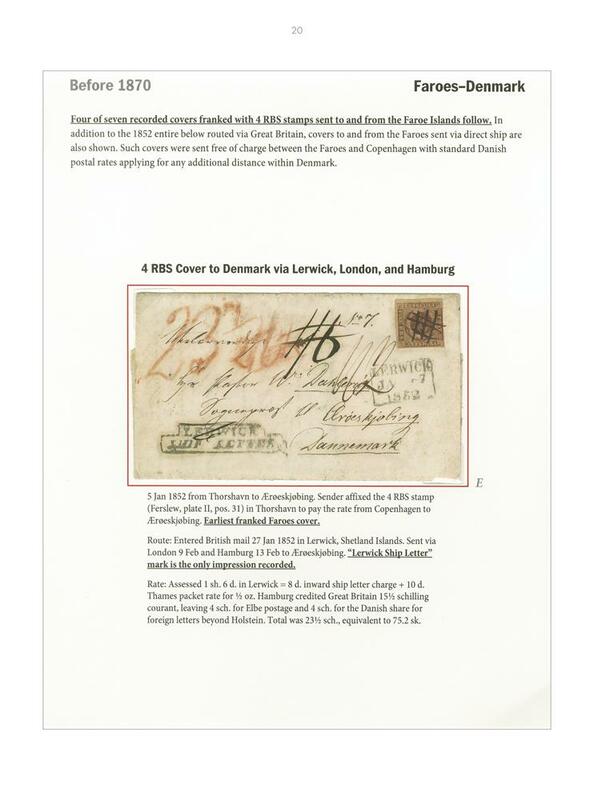 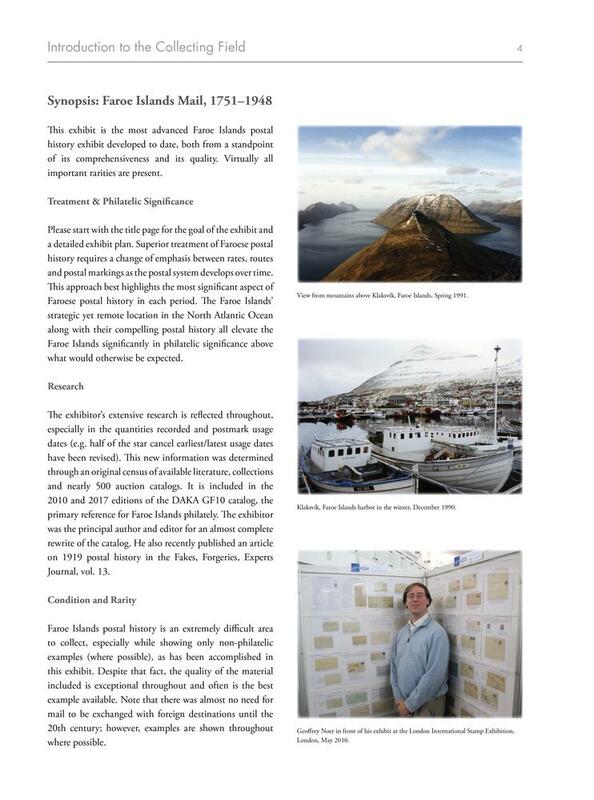 Kersti and Bertil have – since their beginnings – always relied on primary resources and have visited and exploited postal and postal museum archives in Stockholm, Copenhagen, London and Paris. 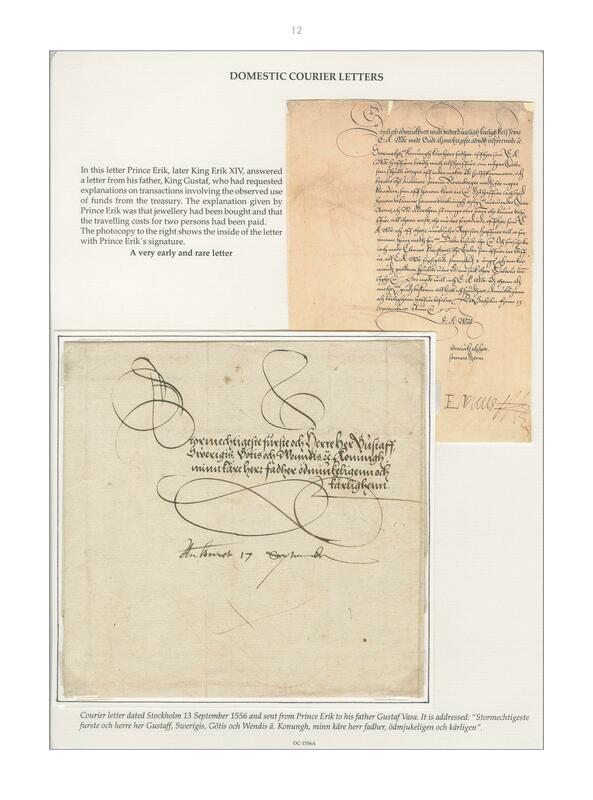 They have worked through historical documents from the Swedish National Archives from 1636 to 1892 and make use of the acquired knowledge in all their publications and descriptions in their collections. 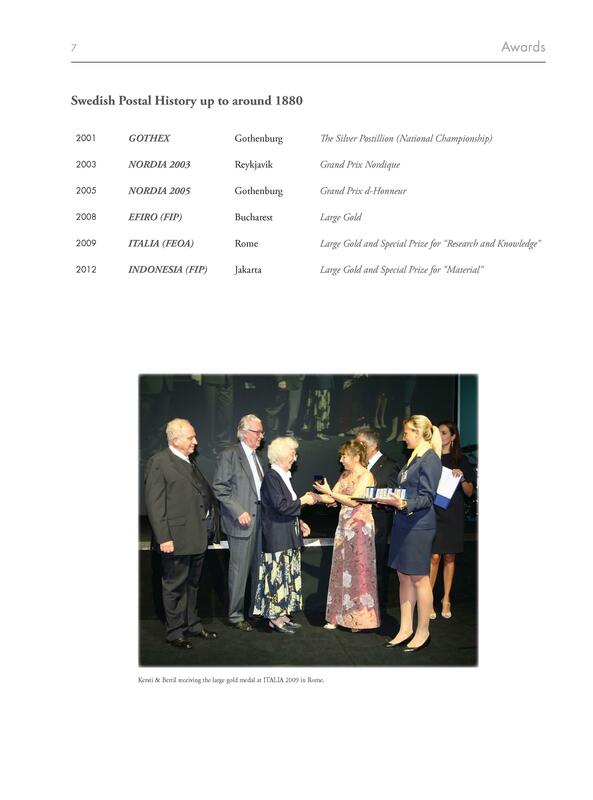 They have exhibited their collections worldwide since 1991 and have been awarded all levels of medals including International Large Gold 1997 in San Francisco, 1998 in Milan, 2008 in Bukarest, 2010 in Lisbon, 2012 in Jakarta. 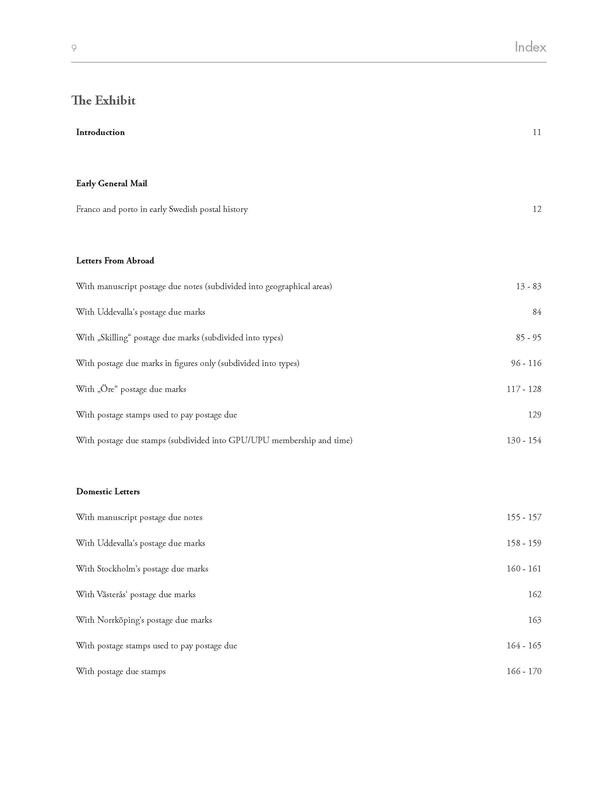 The feeling for the Control of focus in publications and collections. 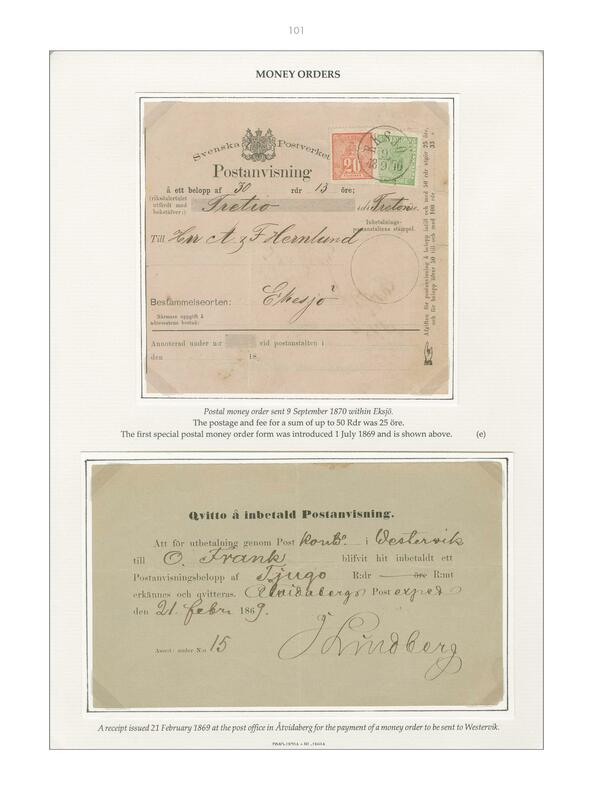 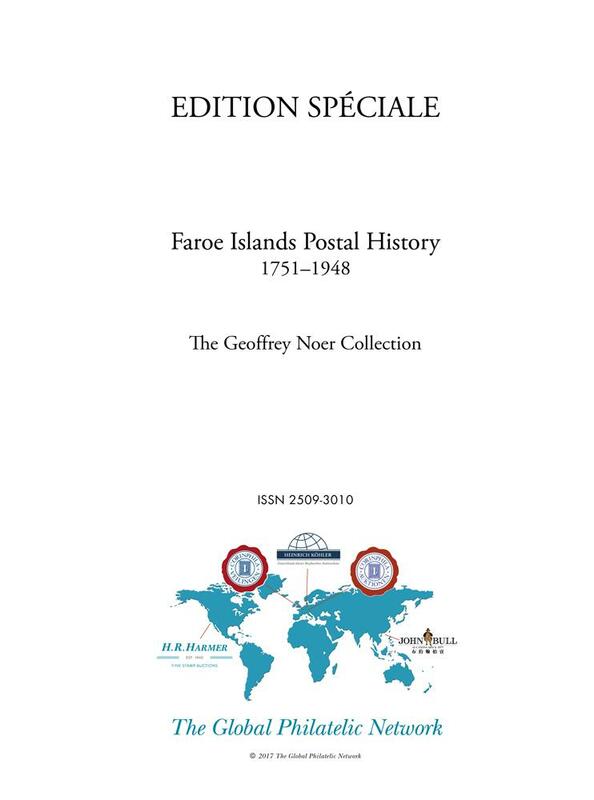 We are proud and honoured to present both of the collections of Sweden - Postal History until 1880 & Sweden - Postage Due Mail until 1892 in two EDITION SPÉCIALE. 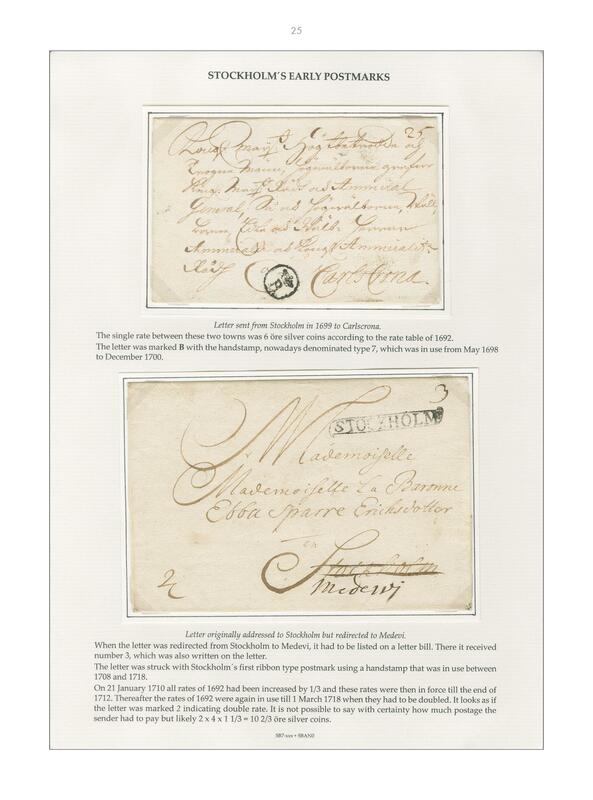 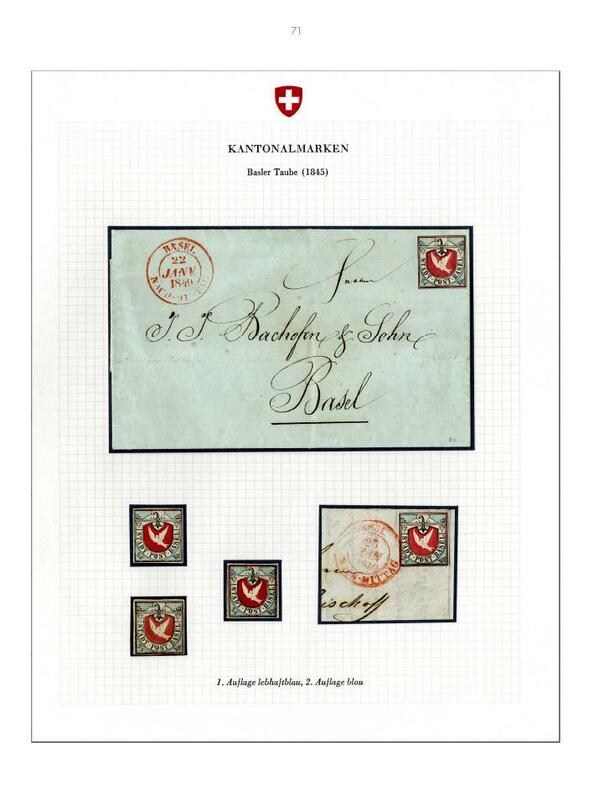 The collection spans more than 400 years of Swedish postal history. 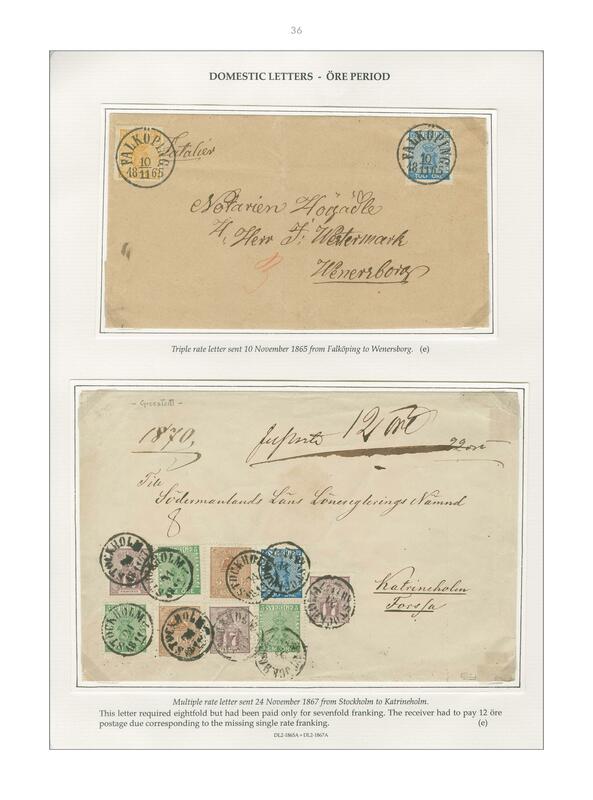 A regular postal service between Stockholm and Hamburg was established in 1620, but it took 16 more years before an actual postal administration was founded in 1636. 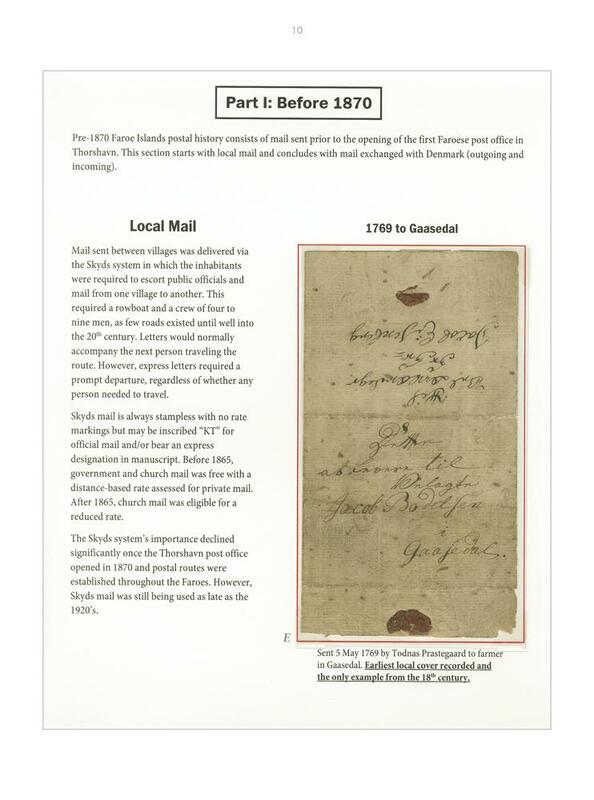 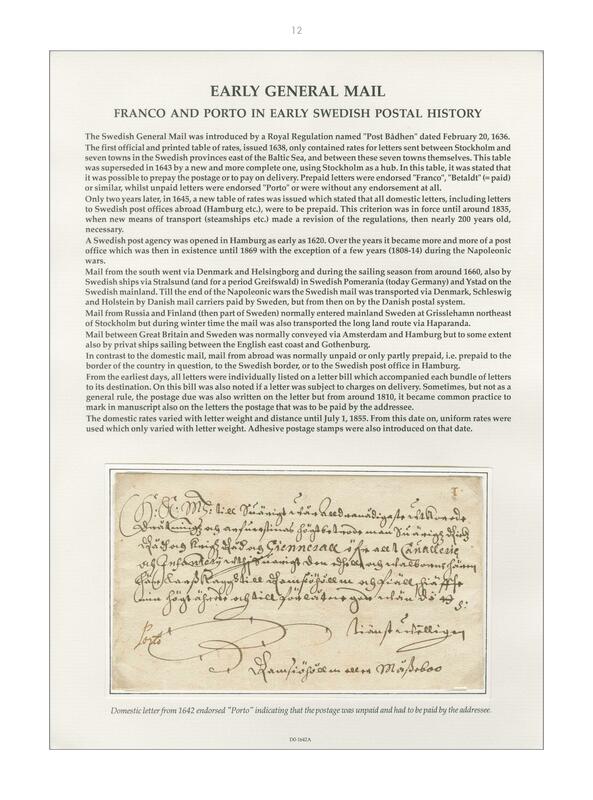 This introduction of the organized postal System in Sweden is documented in the collection by two tremendous Gems of Swedish postal history: The Royal Decree ‘Postbaden’ of 1636 ans A letter of 1636 forwarded by this newly formed organization, the POST. 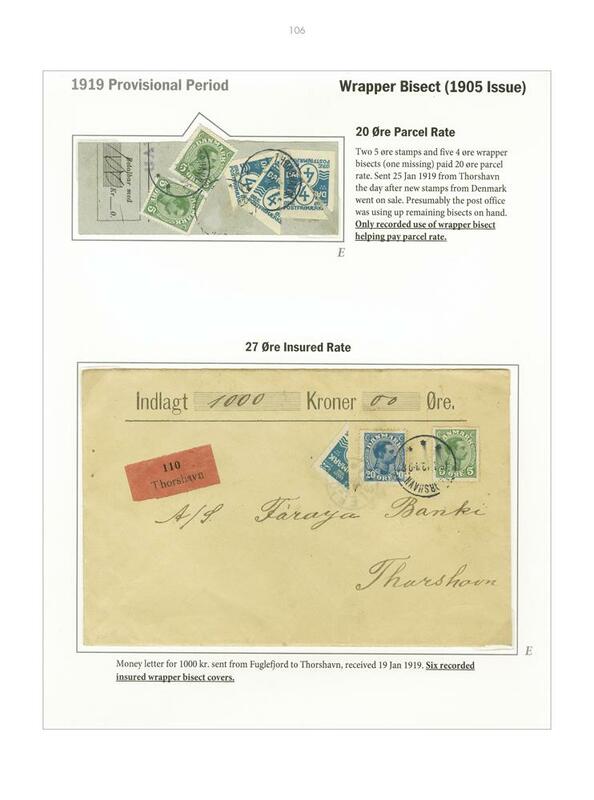 More than 200 years later, in 1855 a uniform postage rate domestically for Sweden was introduced with the system based on weight and using postage stamps, as was being done since 1840 in Great Britain. 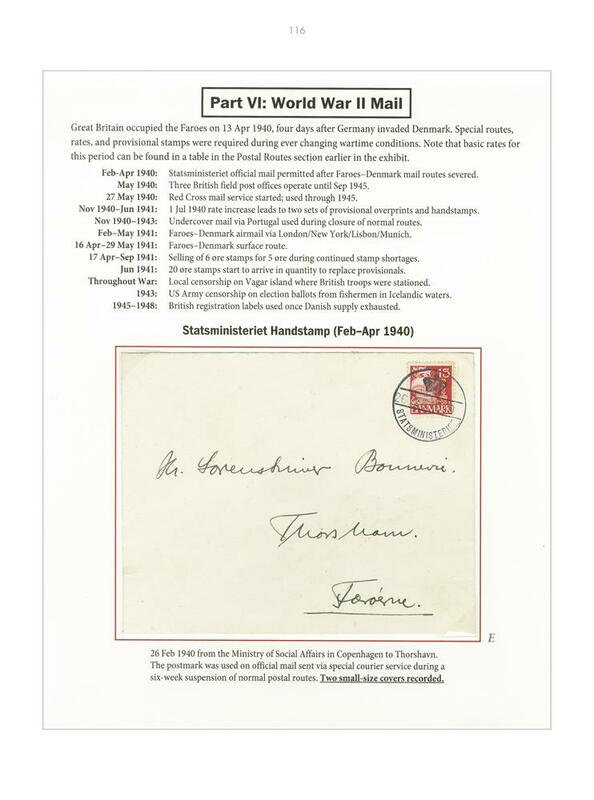 The following offer includes key pieces of the collection, from the pre-stamp period including rarest cancellations and most important documents of Swedish postal history. 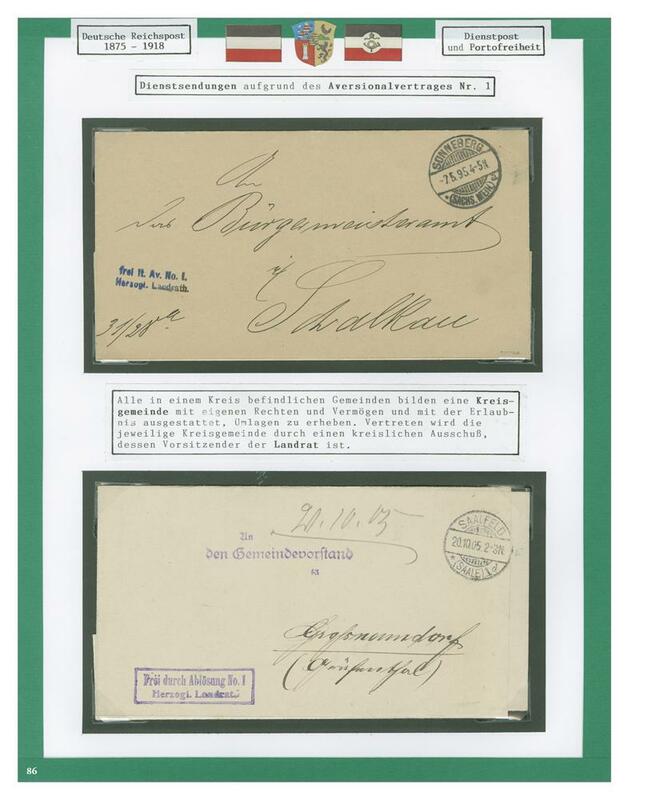 Of course you will also find mail to foreign destinations with wonderful frankings starting with the first stamps of Sweden. 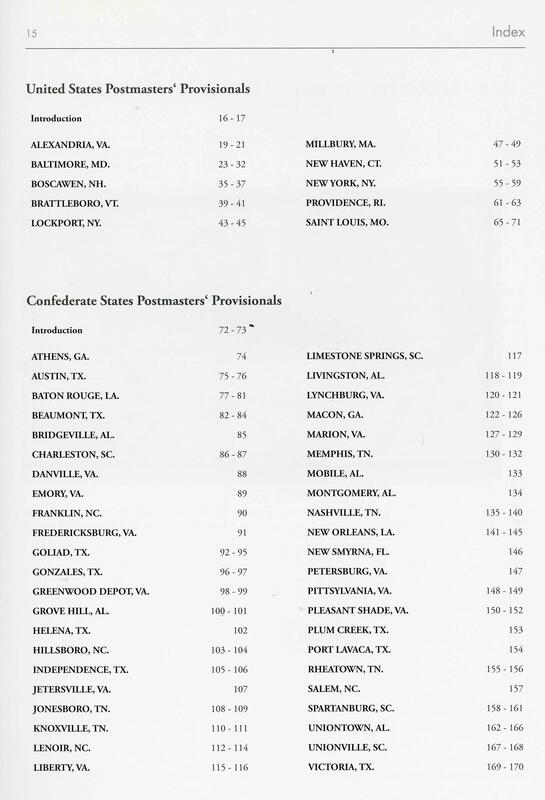 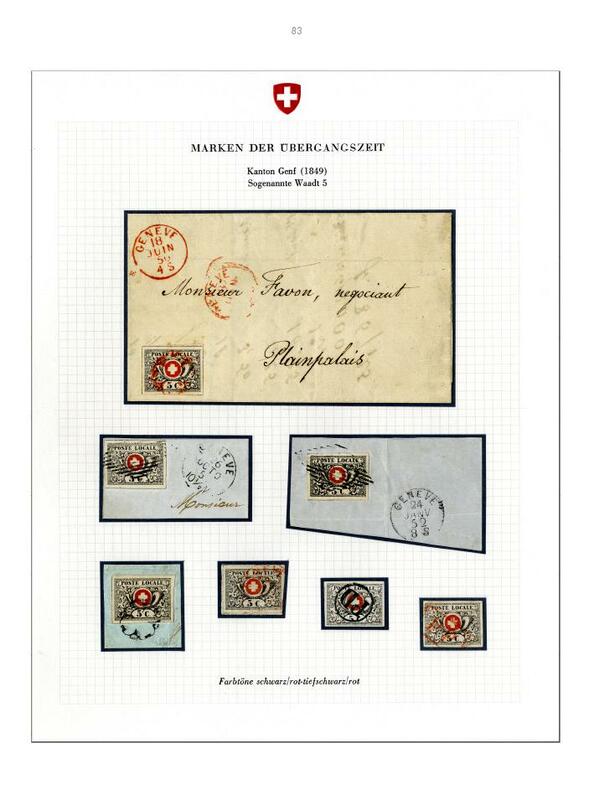 If you hear the name Eduard or Jack Luder, the experienced philatelist will immediately think of Corinphila. 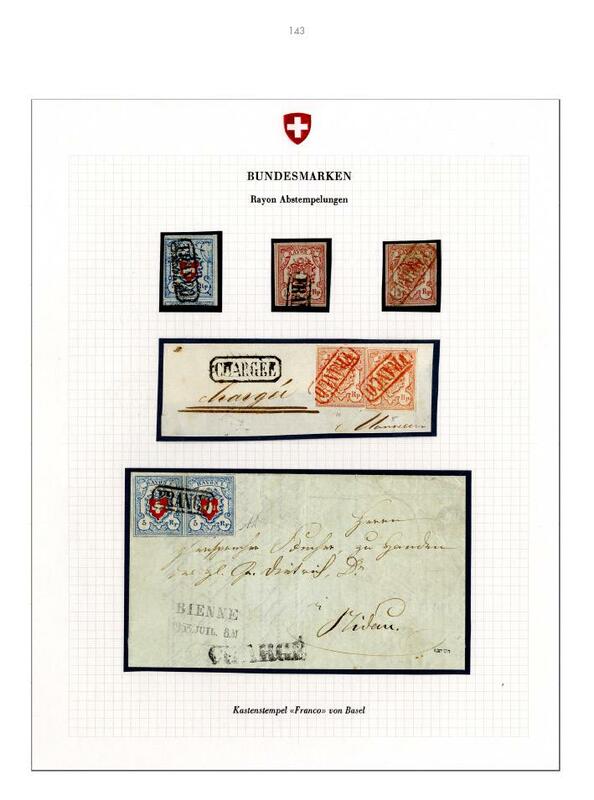 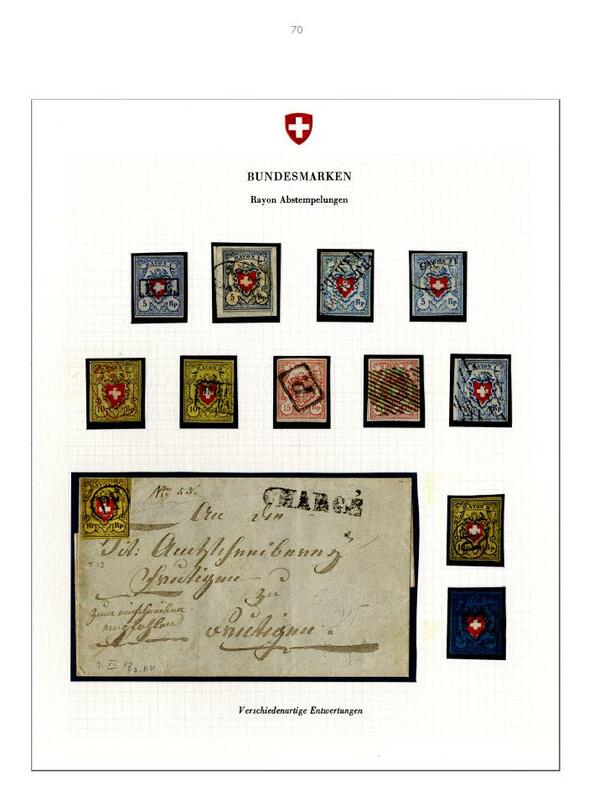 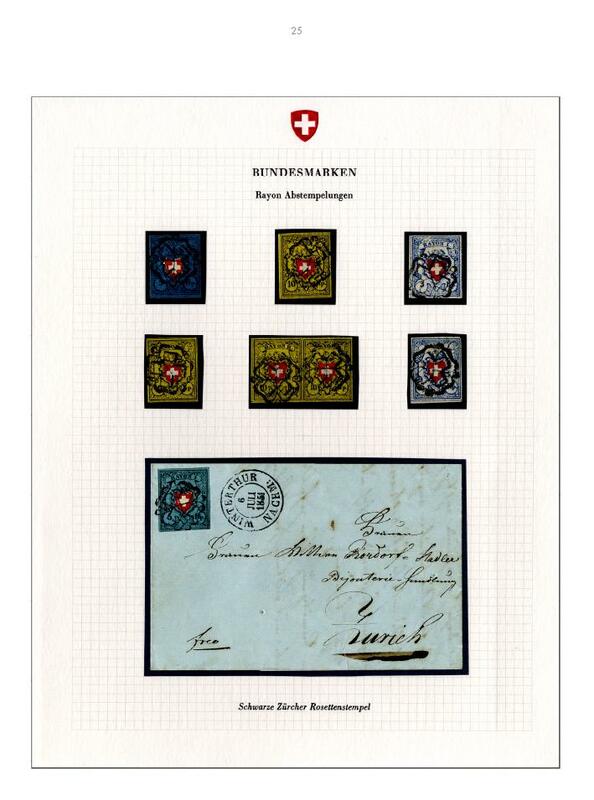 Over a period of eight decades, from 1925 to 1992, father and son Luder have made the nowadays oldest Stamp Auction House in Switzerland to an embodiment for Philately and Stamp Auctions. 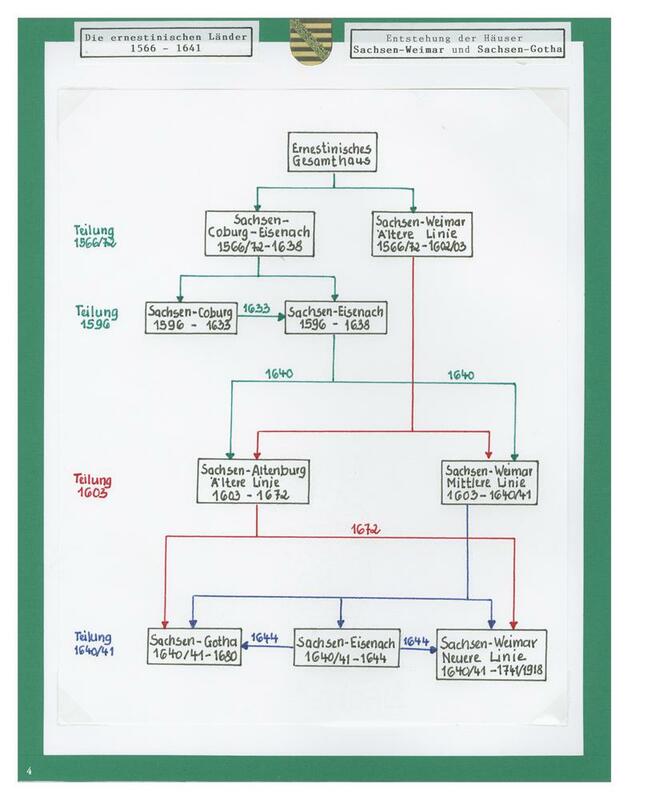 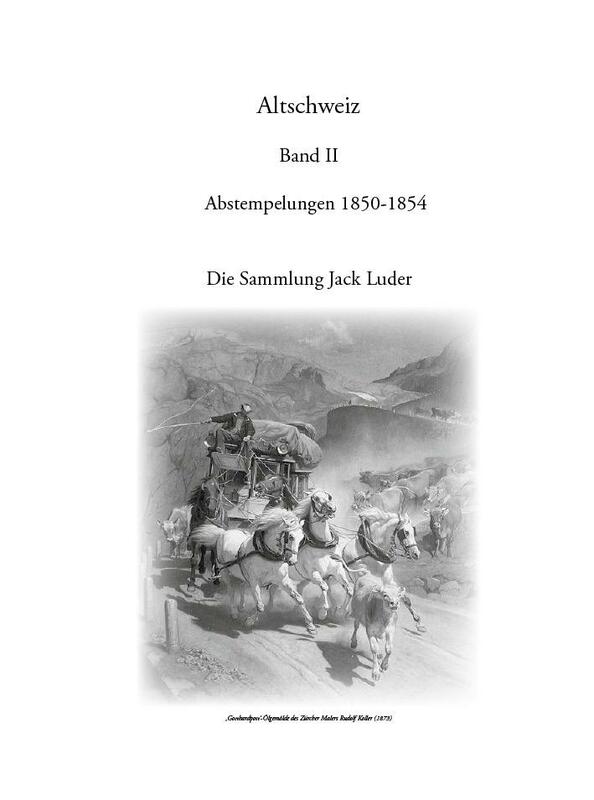 What many do not know: Over many years in secrecy Jack Luder has built up a fabulous collection of Old Switzerland from 1843 – 1863 as well as cancellations from 1850 – 1854. 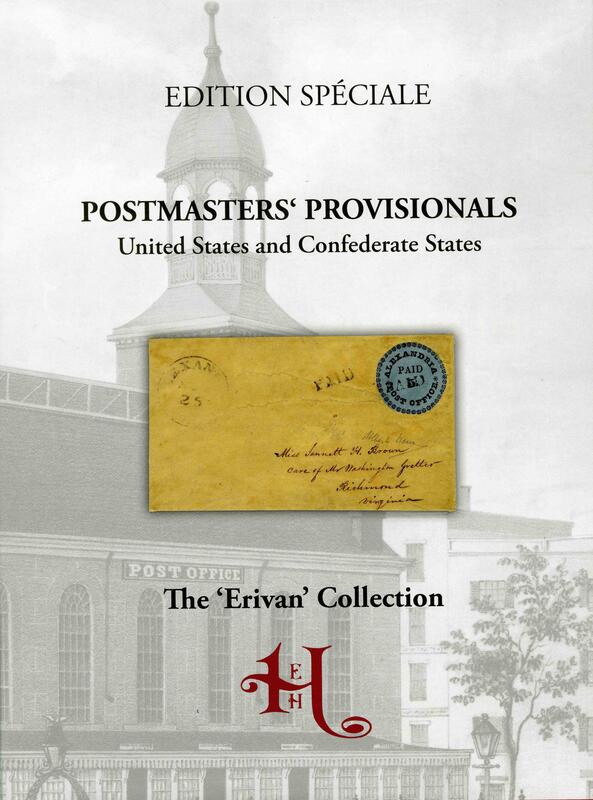 Only a few friends and acquaintances knew about this collection. 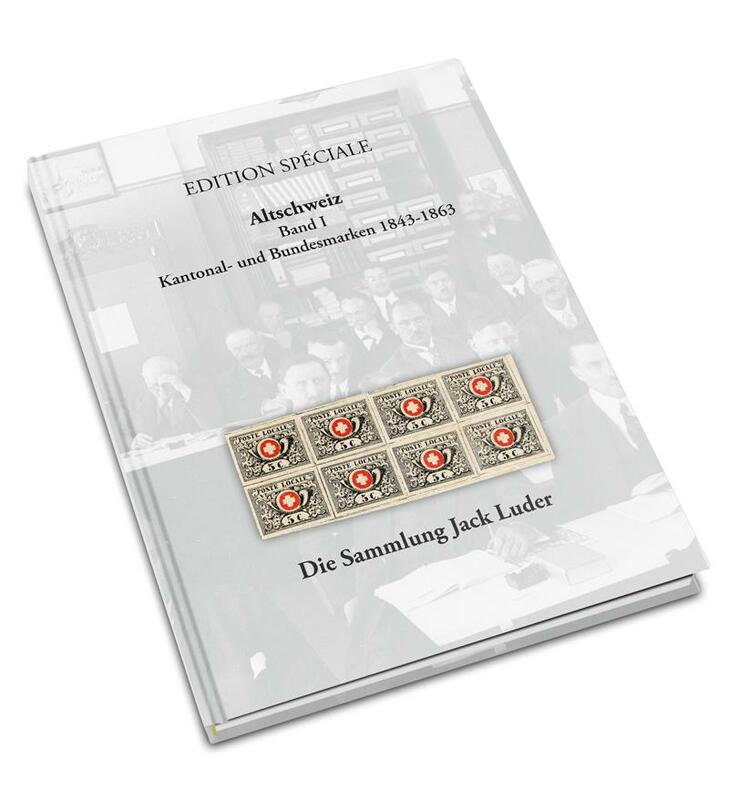 Jack Luder who died in 2015 had shown only very few collectors his philatelic jems. 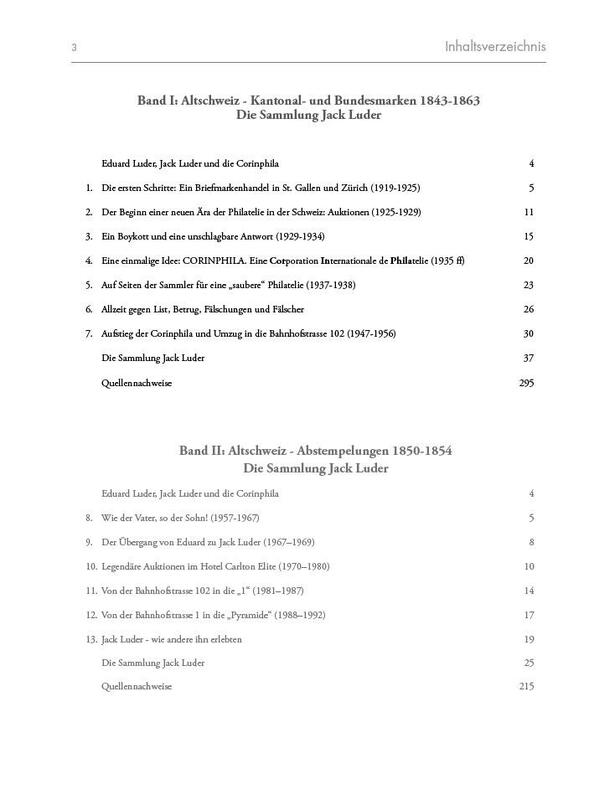 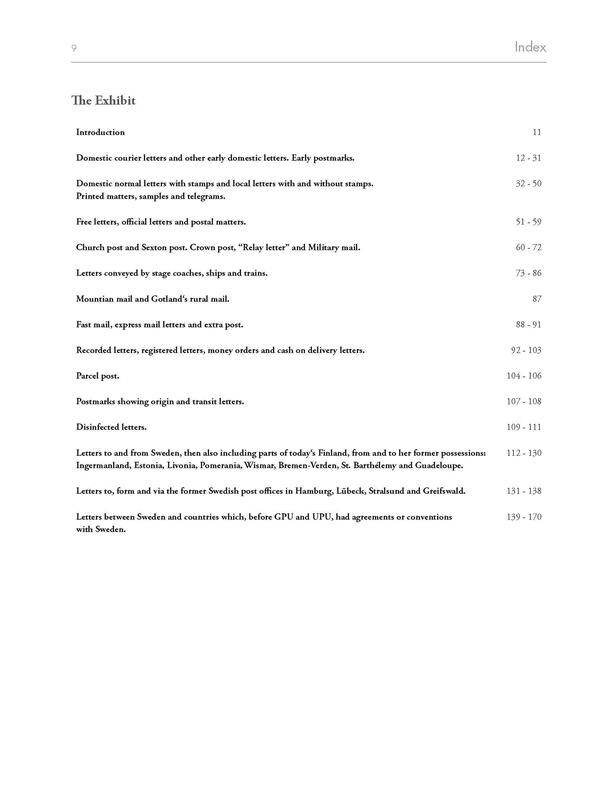 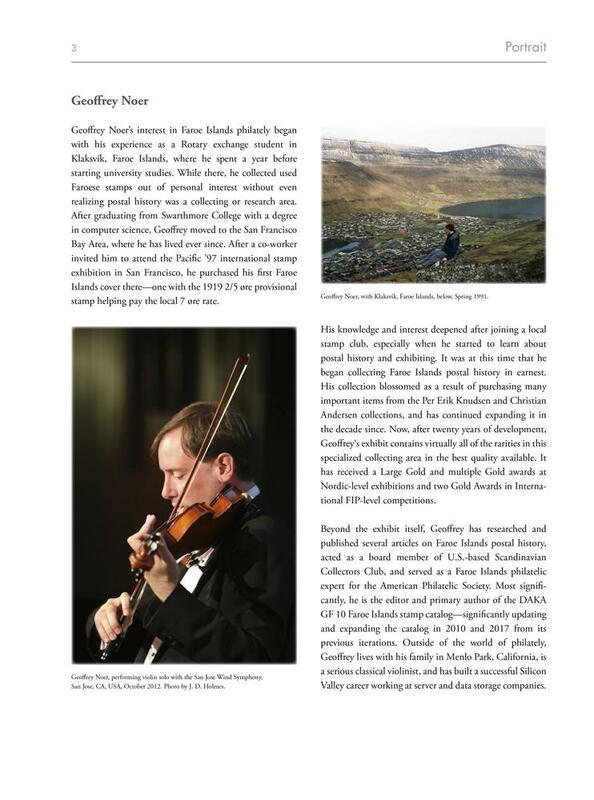 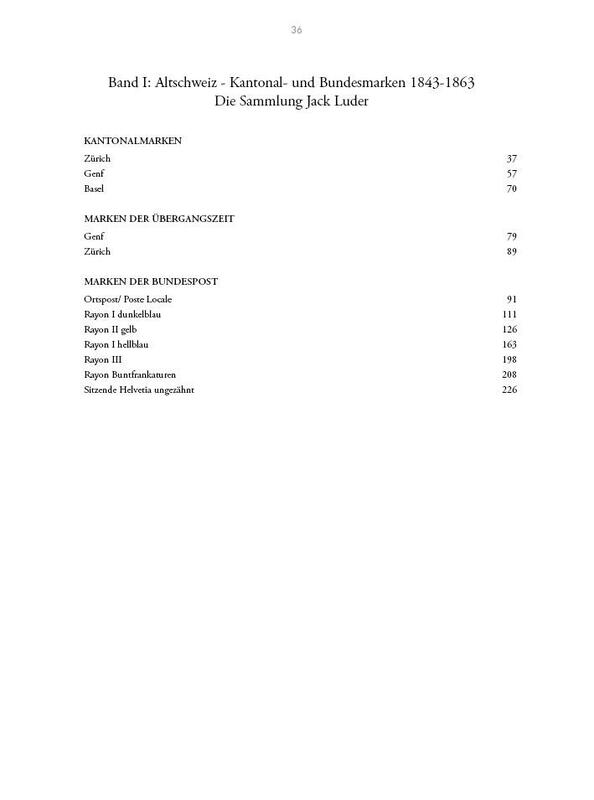 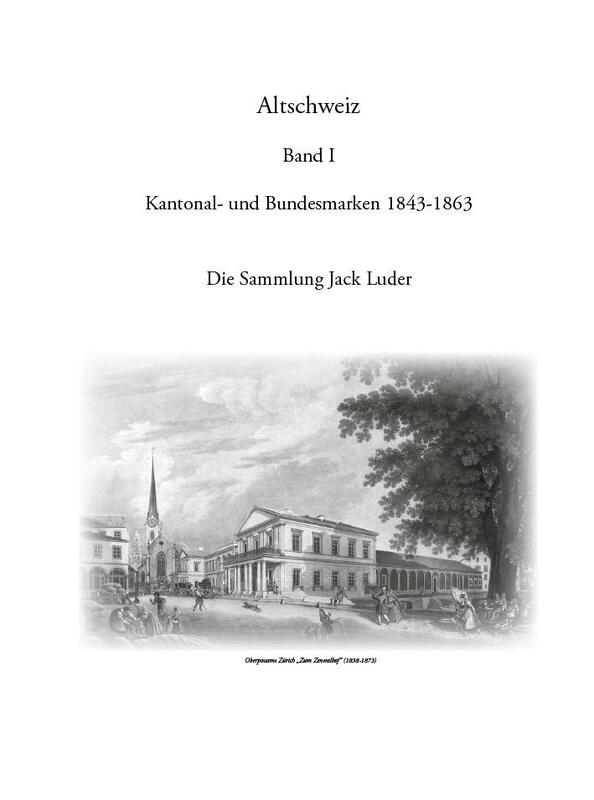 The extensive history of Eduard Luder, Jack Luder and Corinphila as well as the Collection of Old Switzerland of Jack Luder himself push the boundary of a publication in one volume. 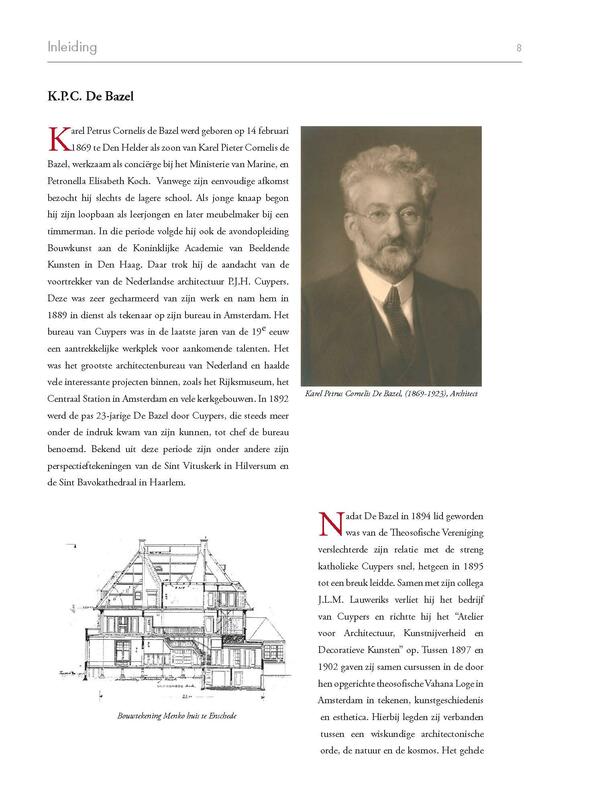 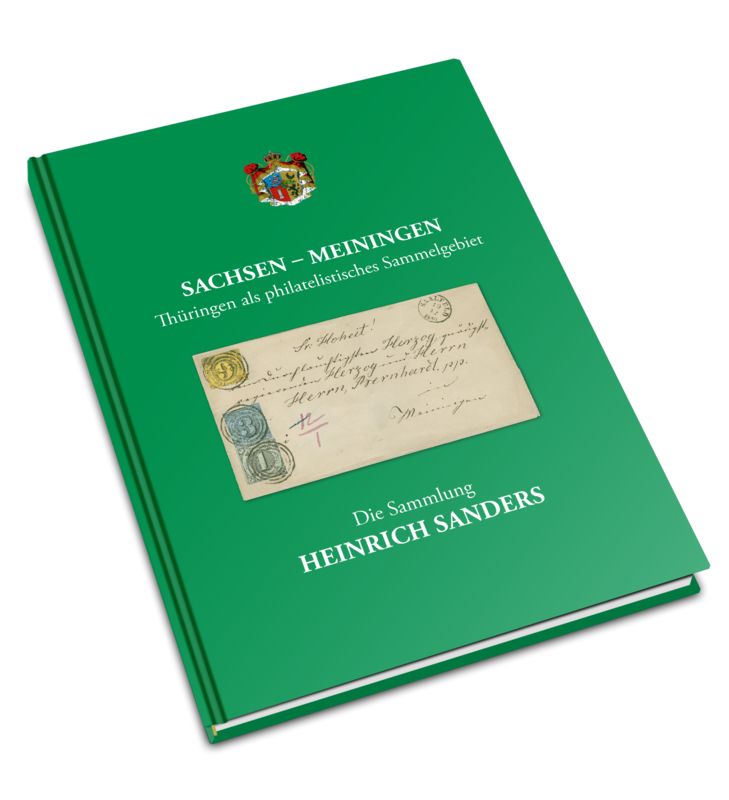 Thus, the editor Corinphila together with the family Luder have decided to publish the history as well as the big collection in two volumes. 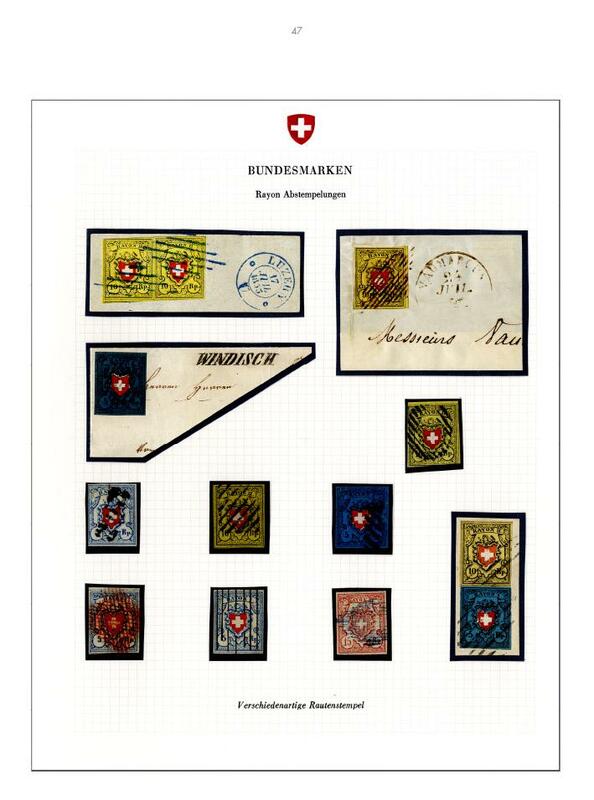 Volume I of the collection of Jack Luder shows the traditional collection of the cantonal and national stamps of the years 1843 to 1863. 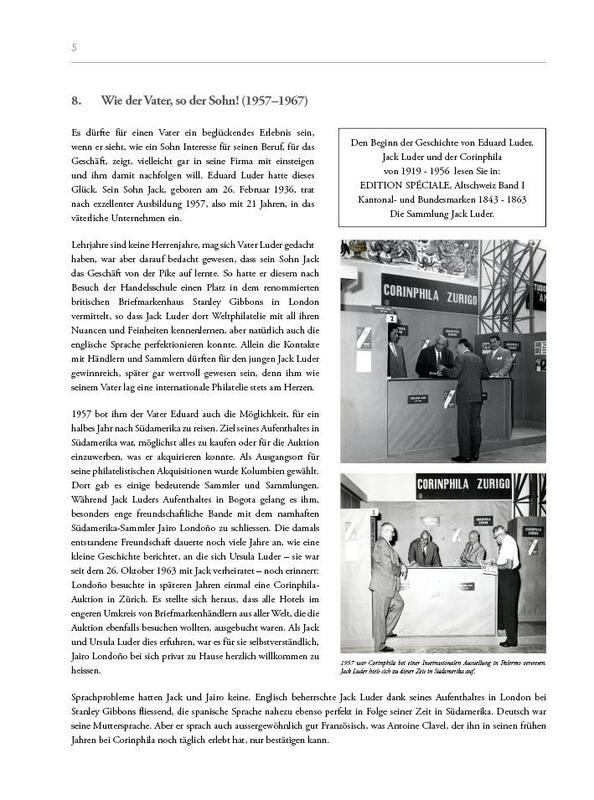 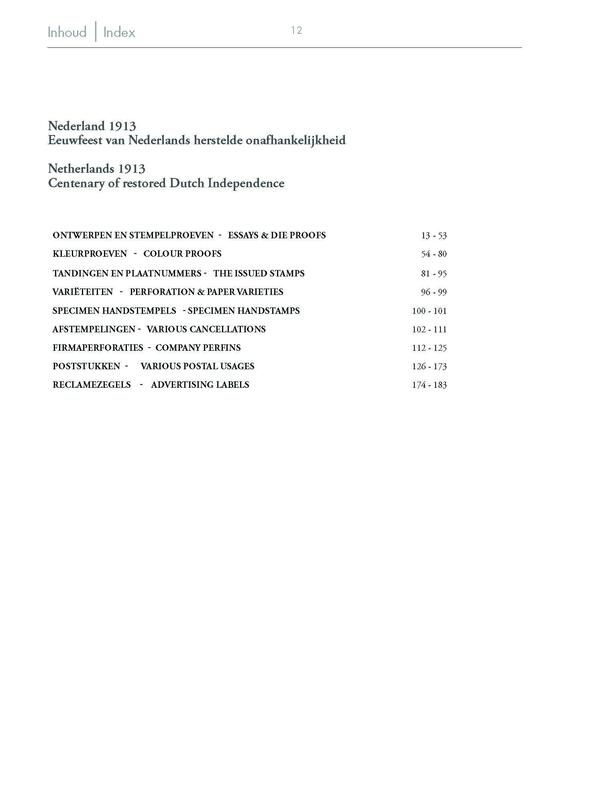 Also in this volume you will find the history of Eduard Luder and Corinphila from the beginning in 1919 until his sudden and unexpected death in 1967. 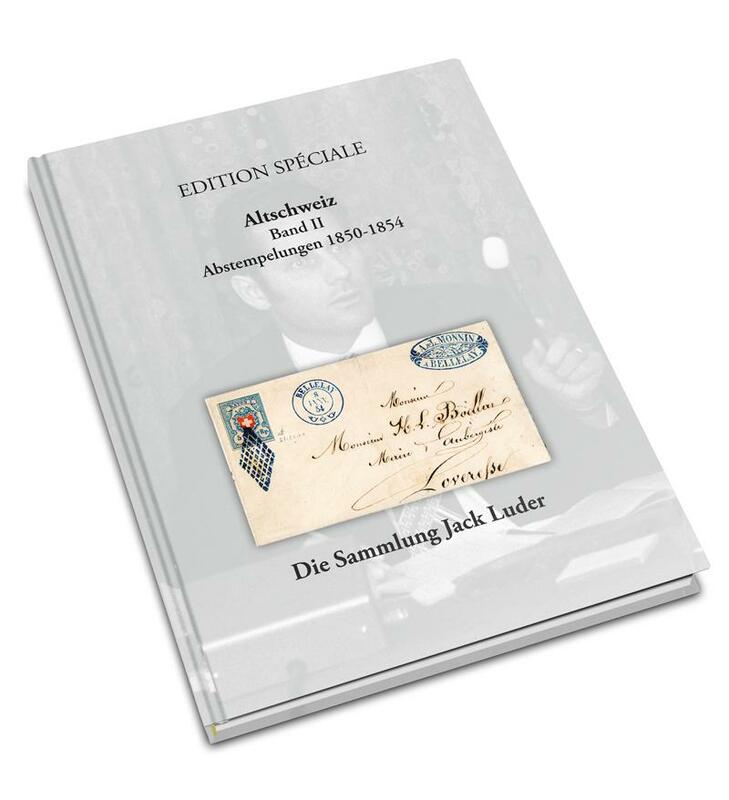 Apart from the wonderful Old Switzerland collection both volumes also tell the history of Eduard Luder, Jack Luder and Corinphila in the years between 1919 and 1992. 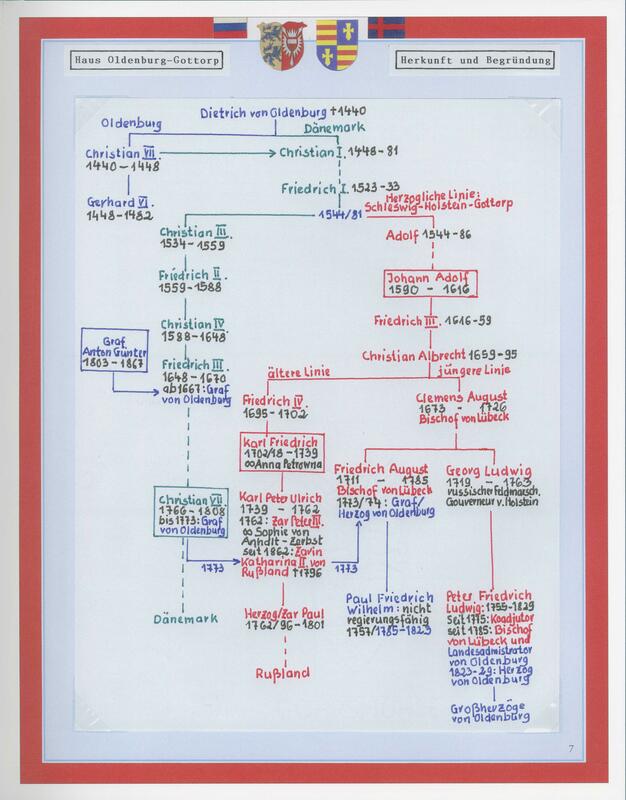 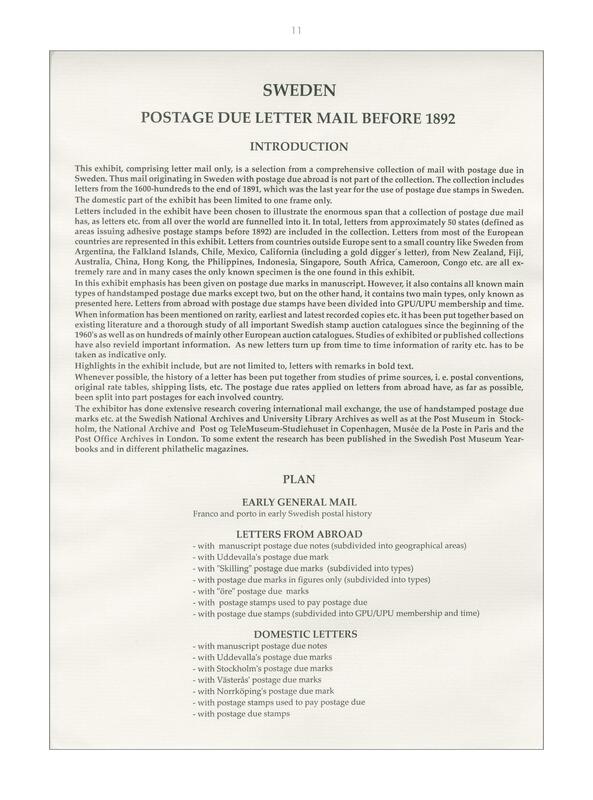 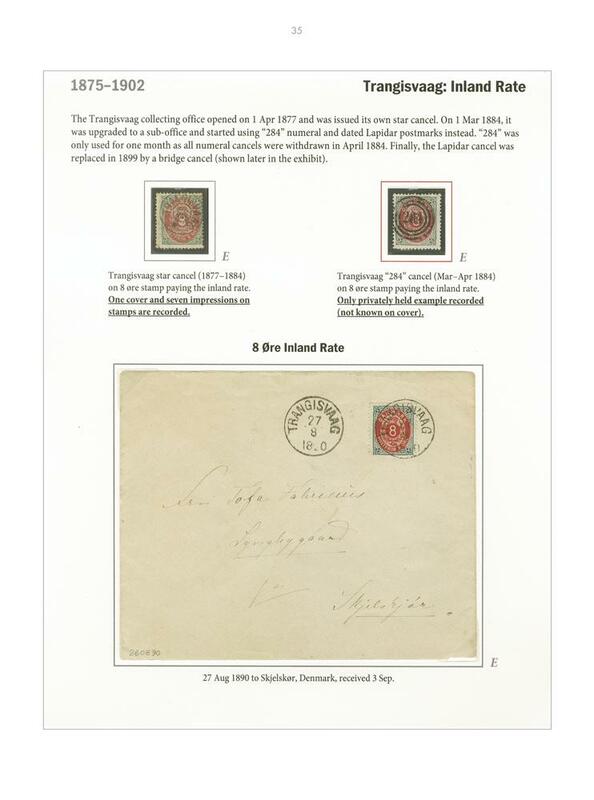 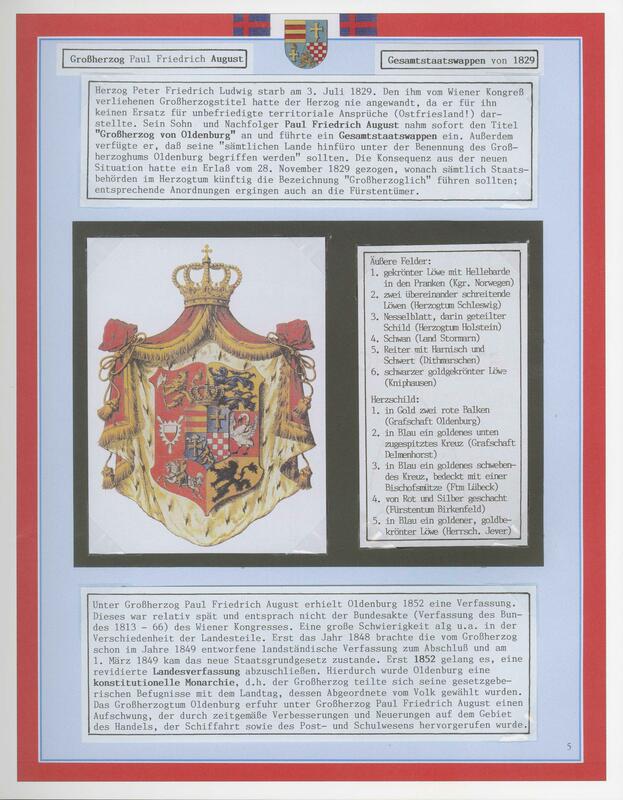 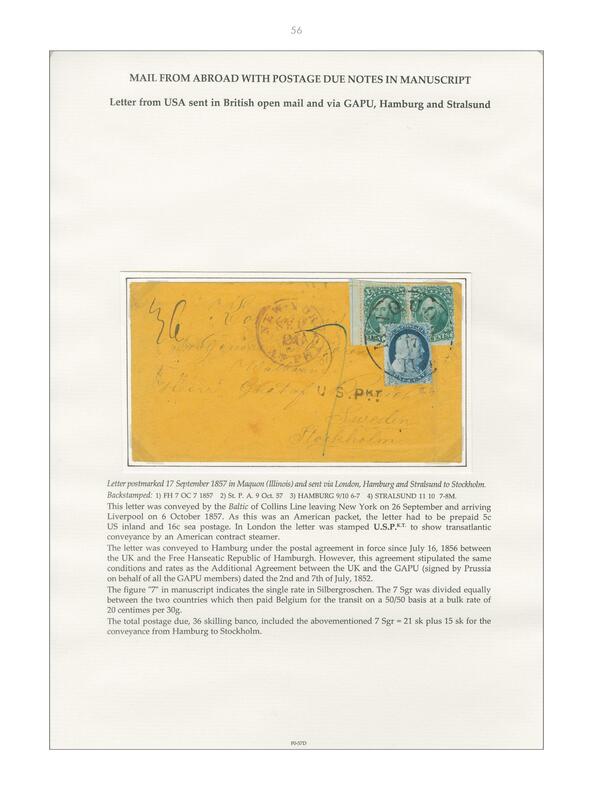 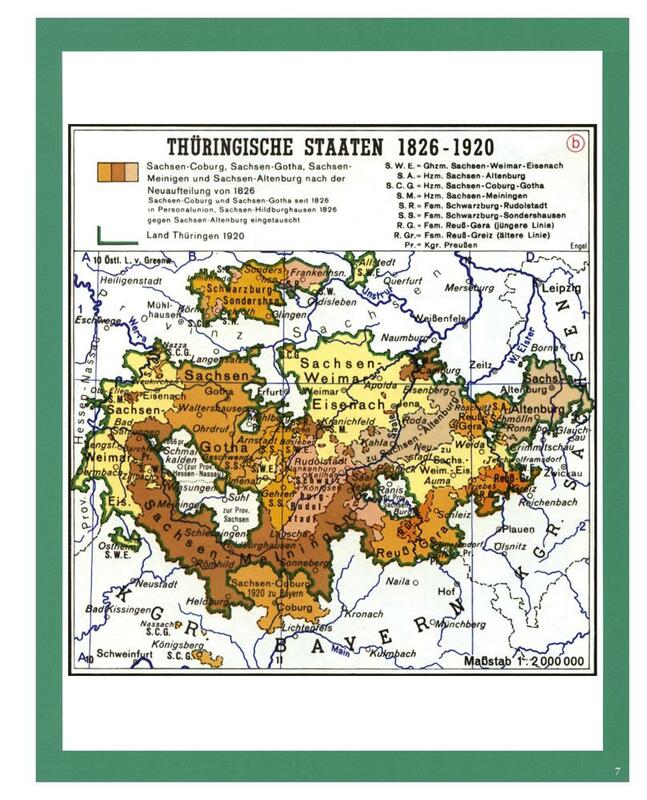 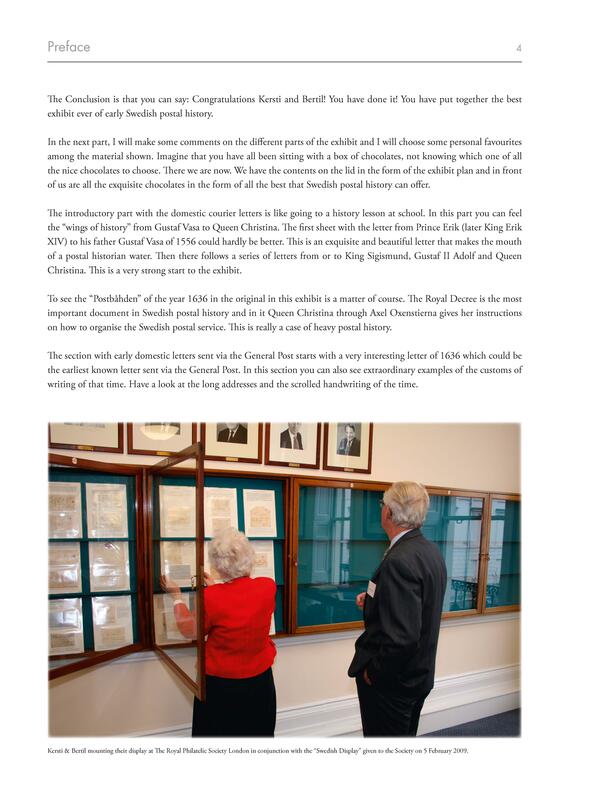 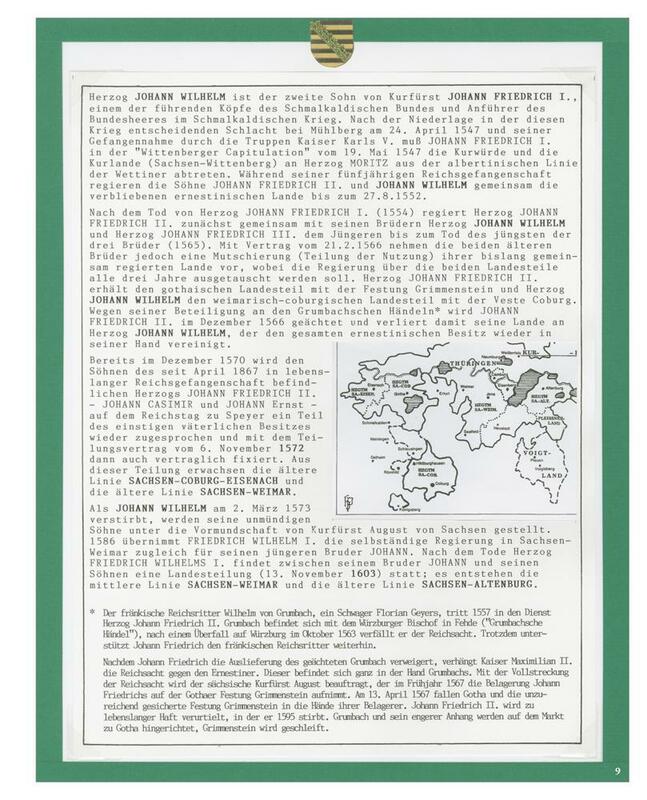 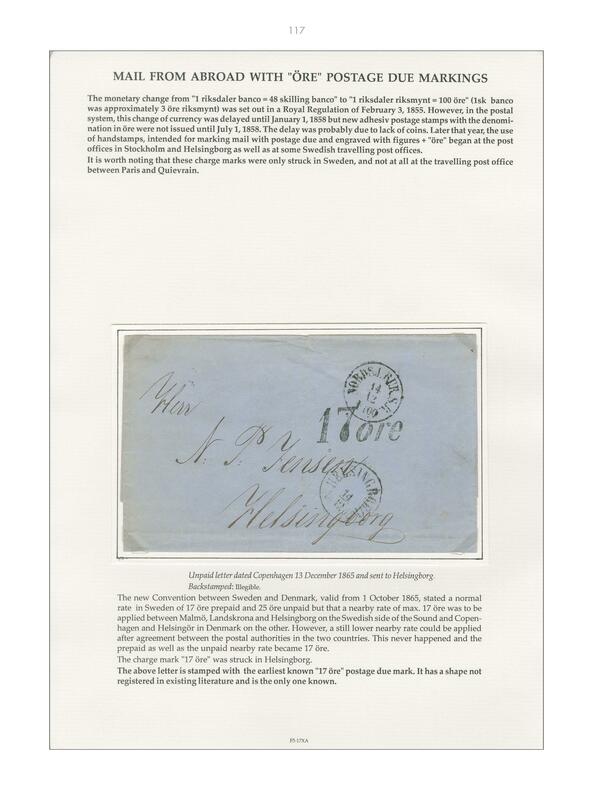 The well-known philately-historian and journalist Wolfgang Maassen RDP, FRPSL, has complexly looked into this voluminous history and told the story. 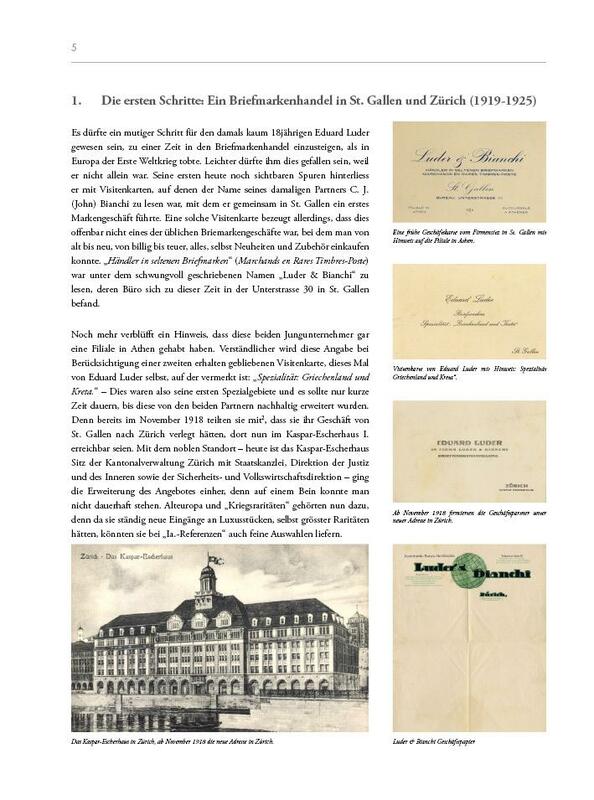 At the same time, the family Luder was able to contribute numerous contemporary photographs and illustrations. 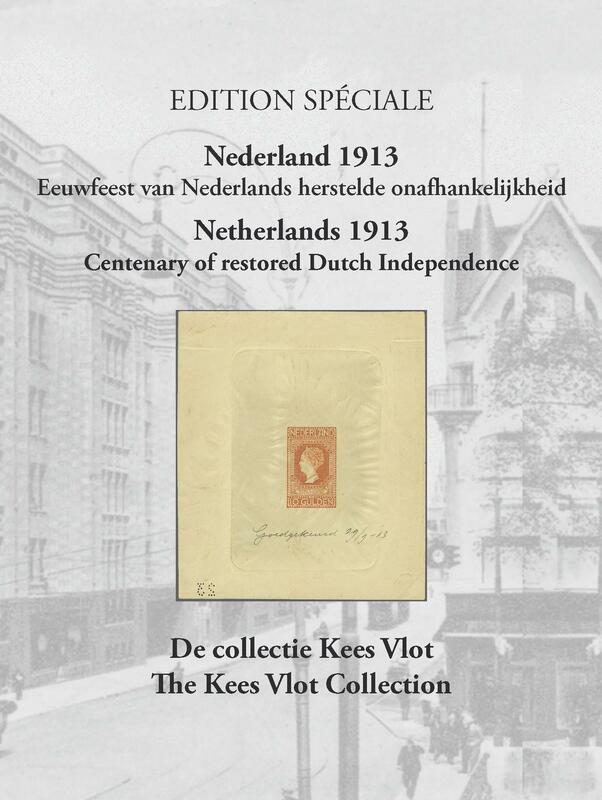 After several decades of collecting Kees Vlot has build up an extraordinary collection that is now first shown to the public. 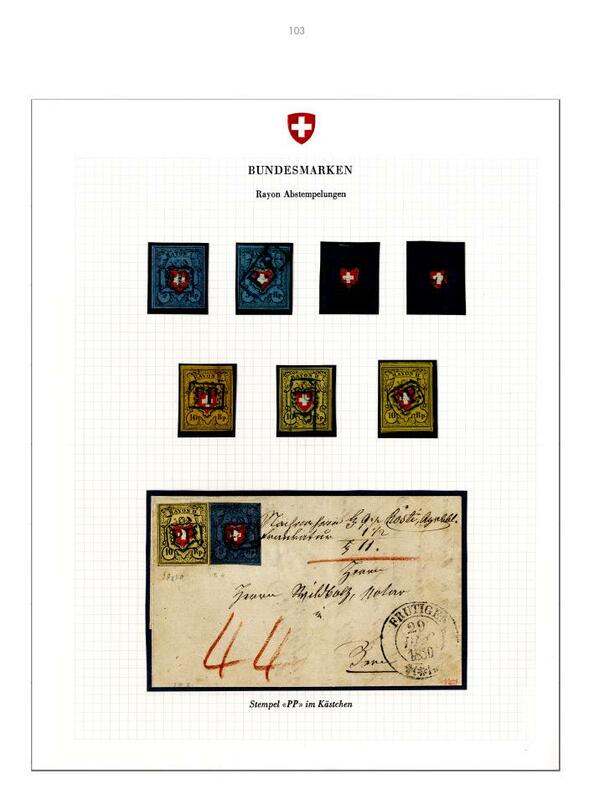 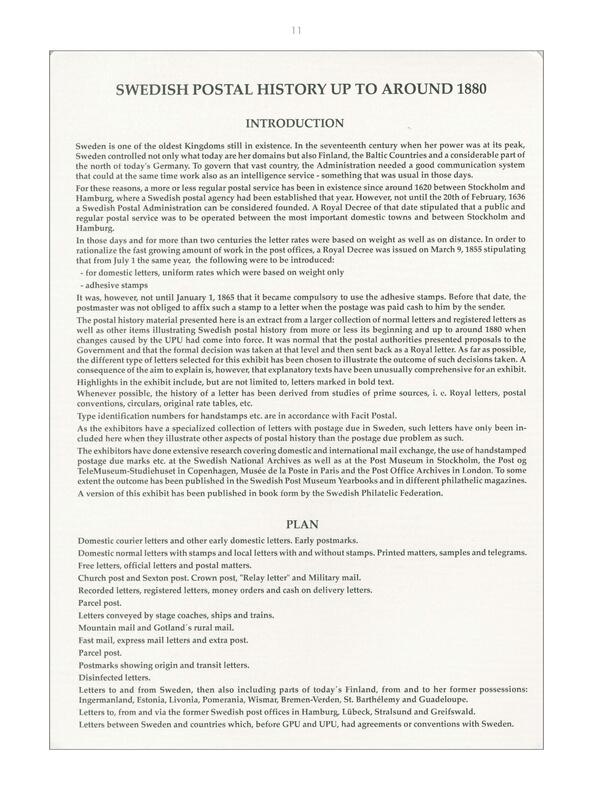 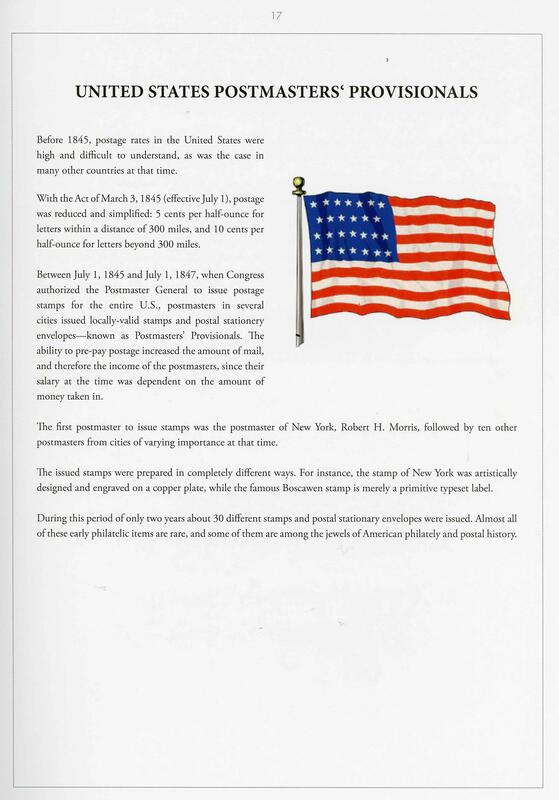 The book has 170 pages with unique items, such as proofs and colour trials, cancellations, perfins and covers of this beautiful issue. 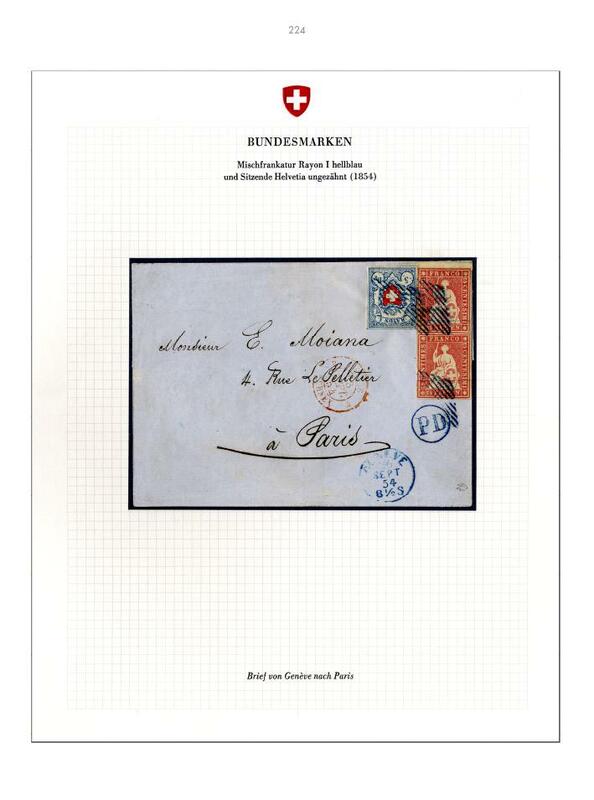 The postage stamps of France reflect, in their design and inscriptions, the turbulent political history of France. 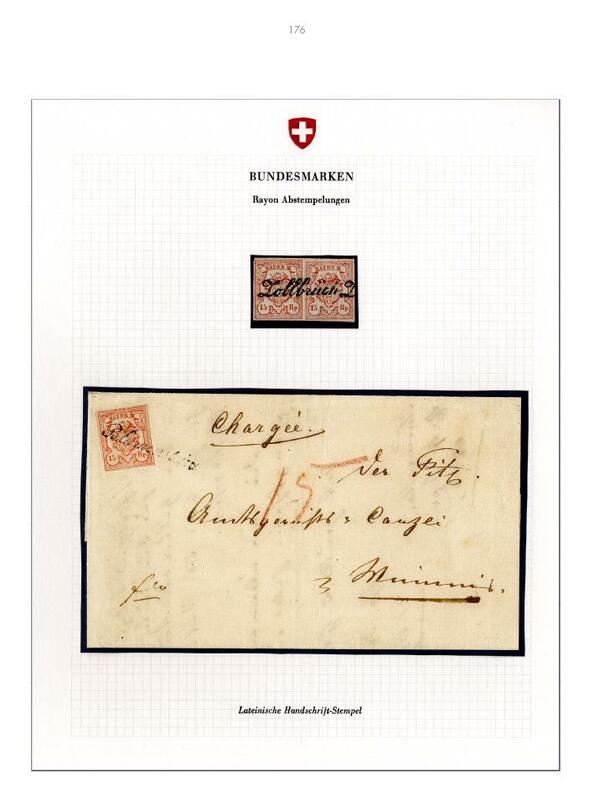 Almost every new stamp Issue owed its origin to a change in the political situation. 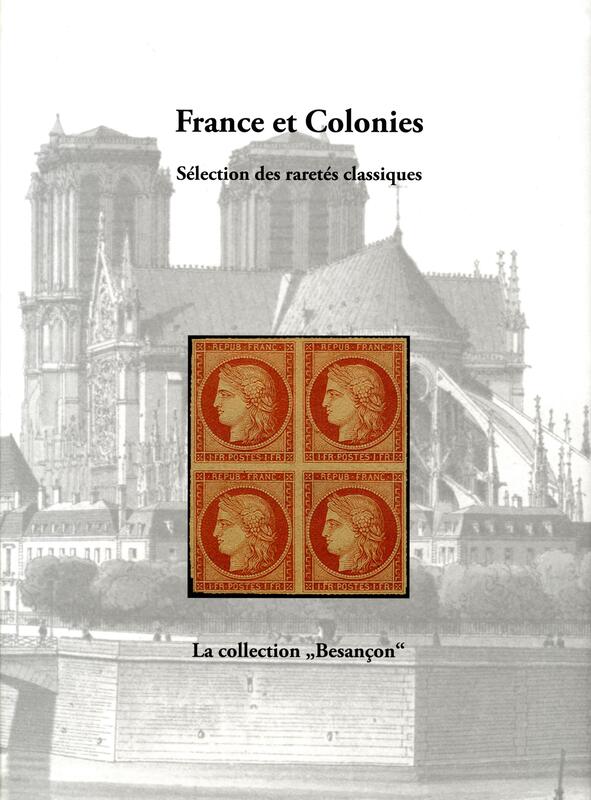 At the same time, the classic stamps of France represent some of the highest standards of 19th century printing: works of art in miniature! 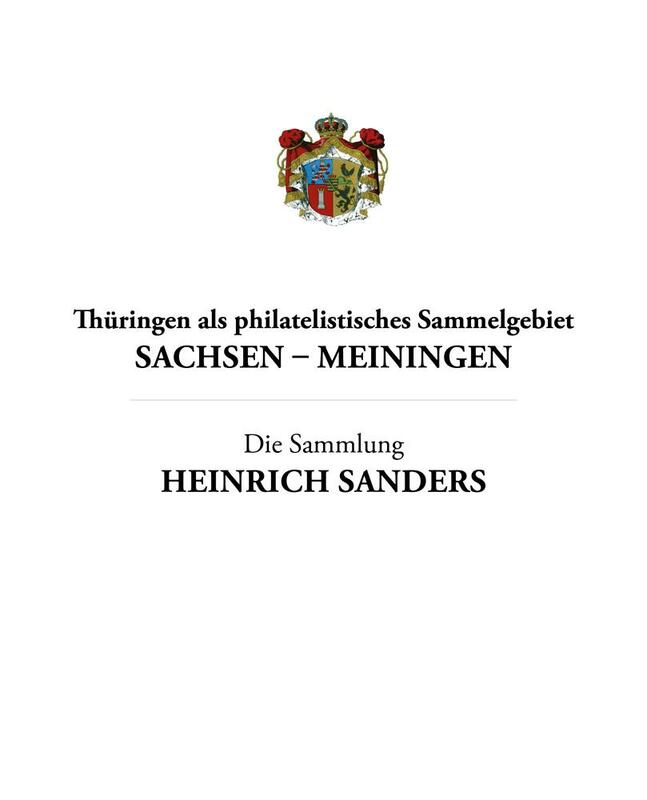 Heinrich Sanders always regretted that the knowledge of the most collectors got lost when their remarkable collections were dissolved. 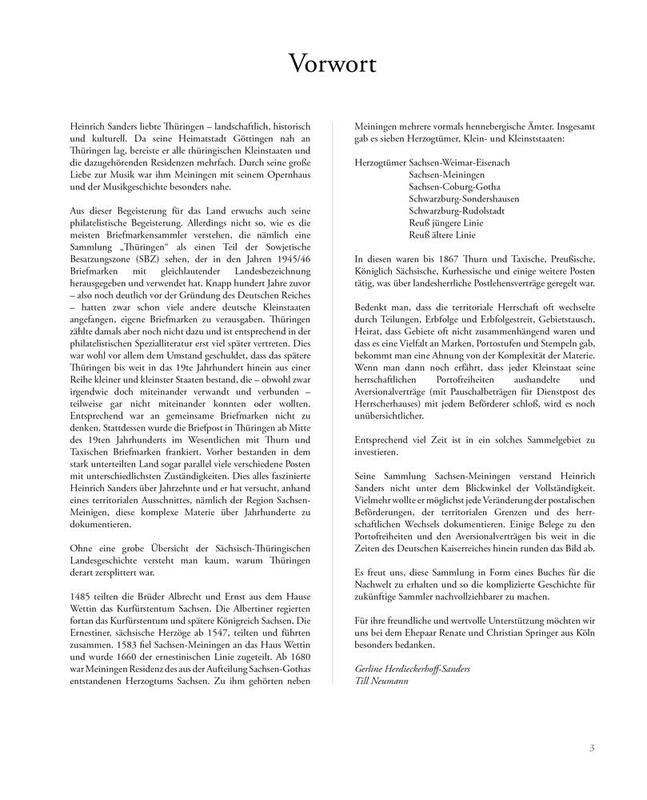 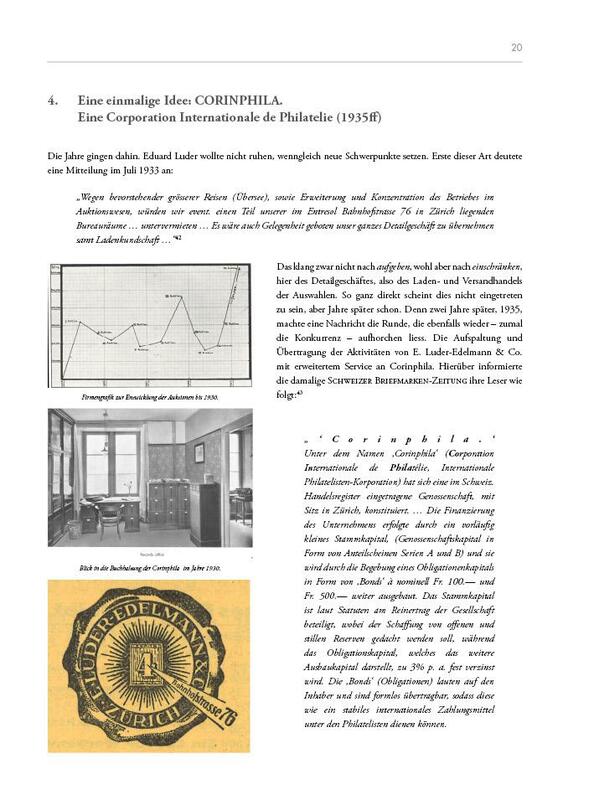 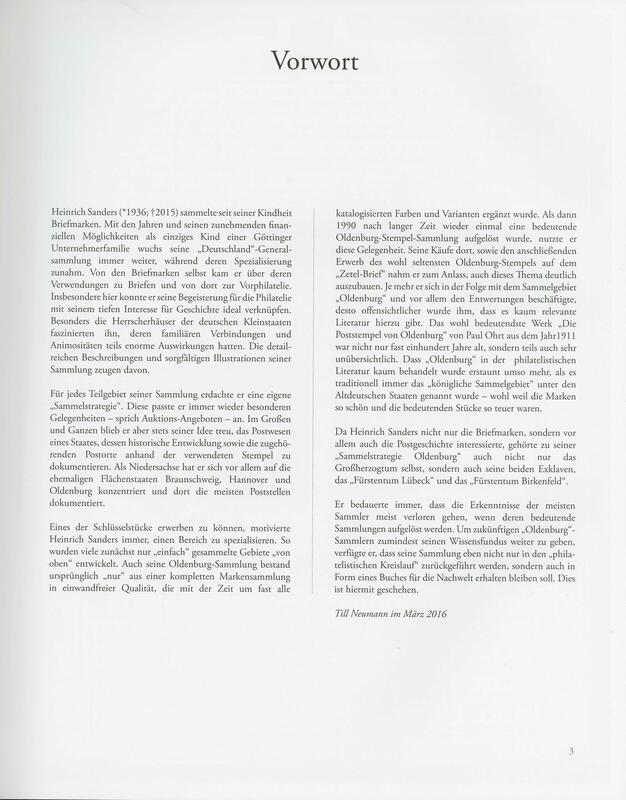 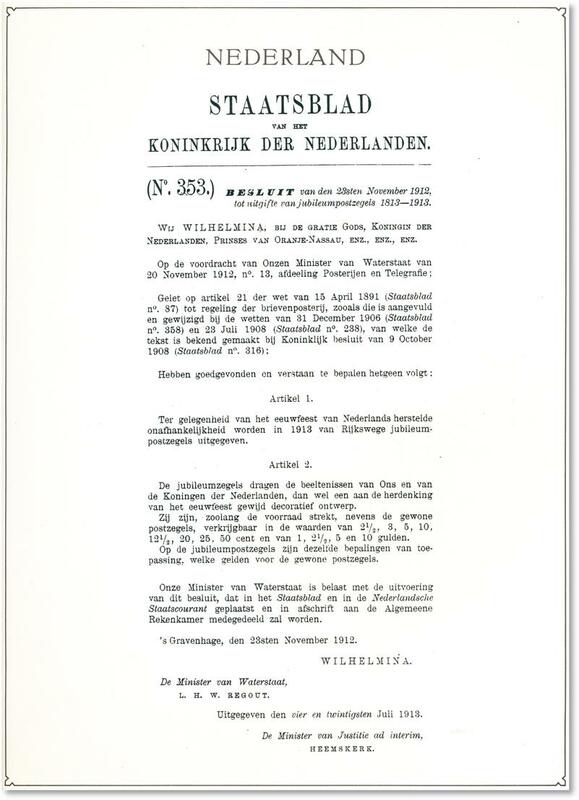 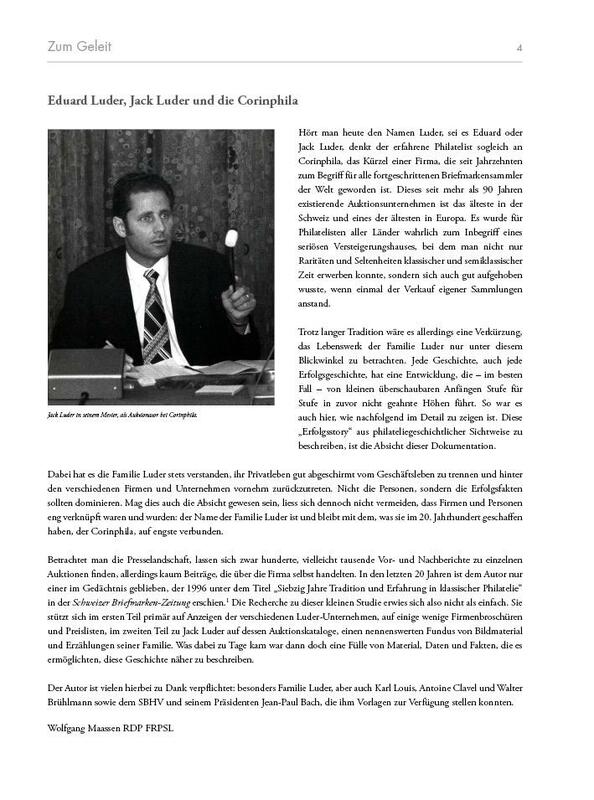 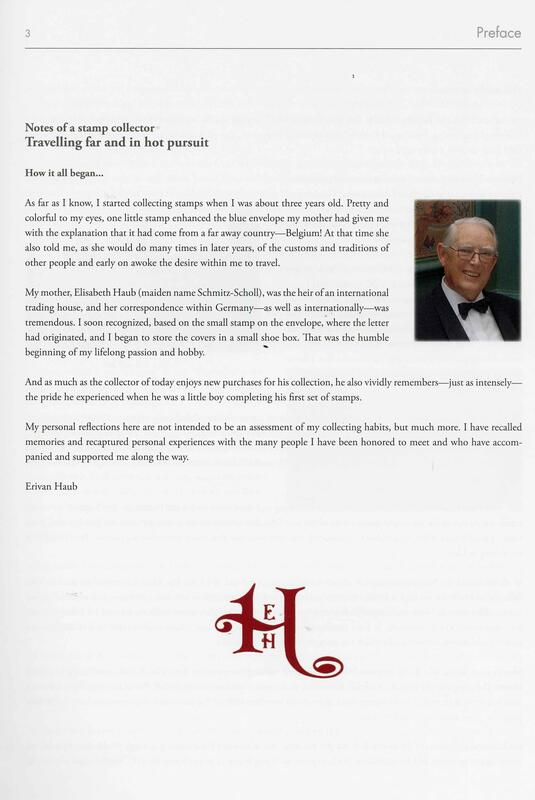 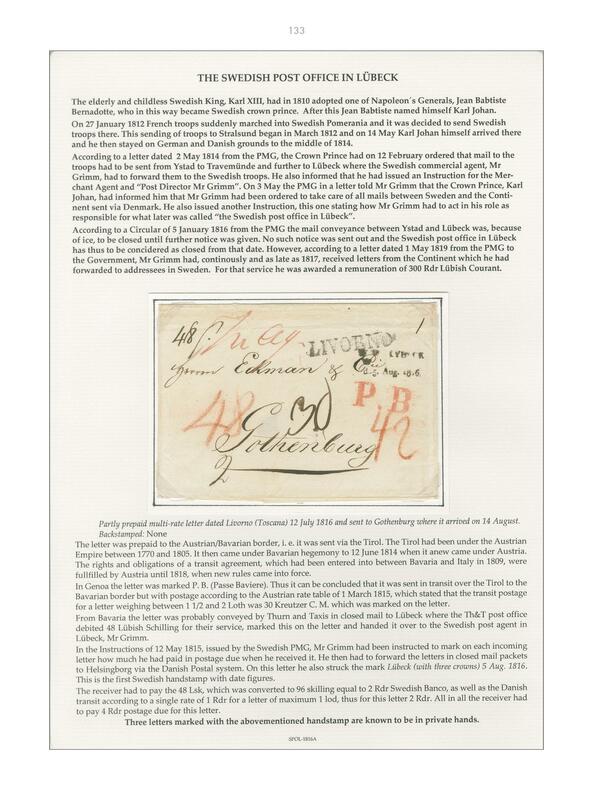 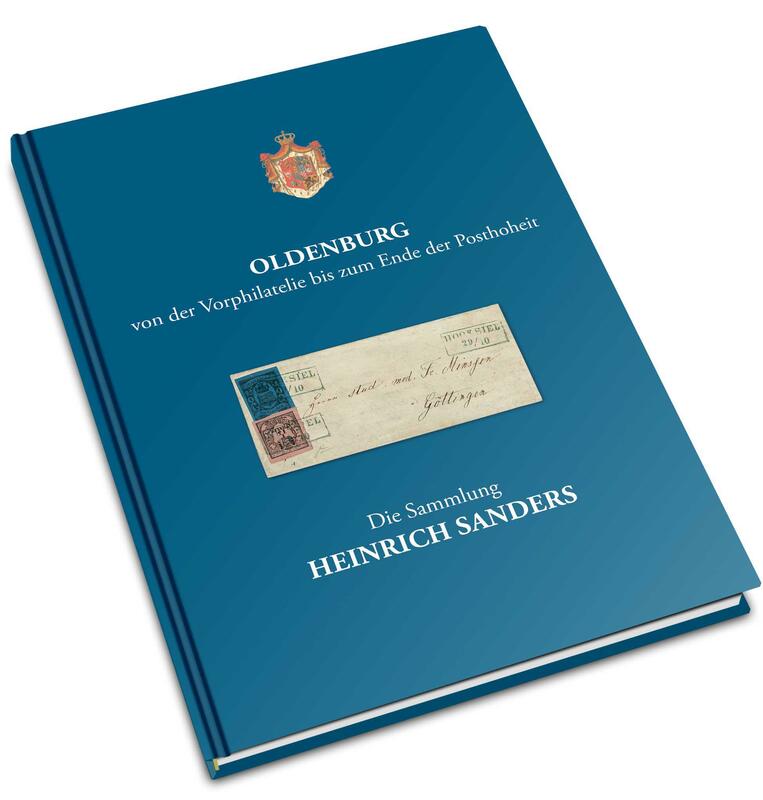 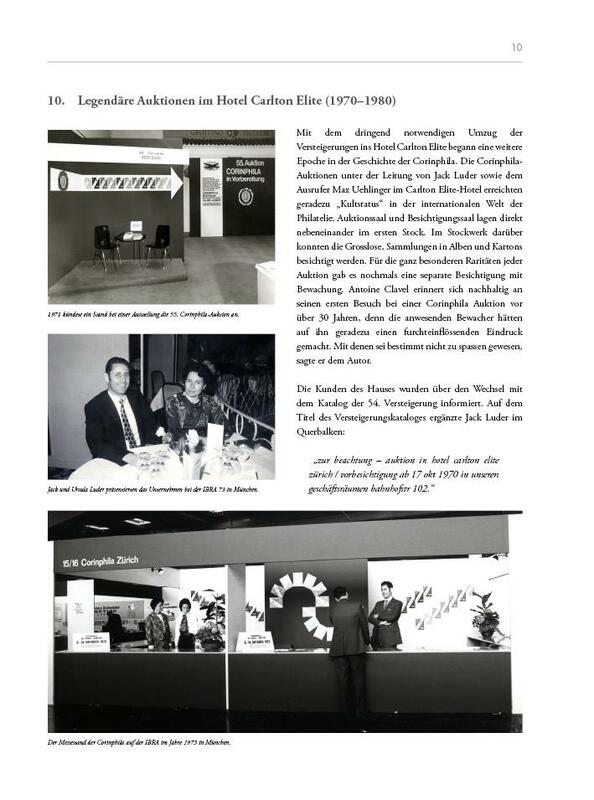 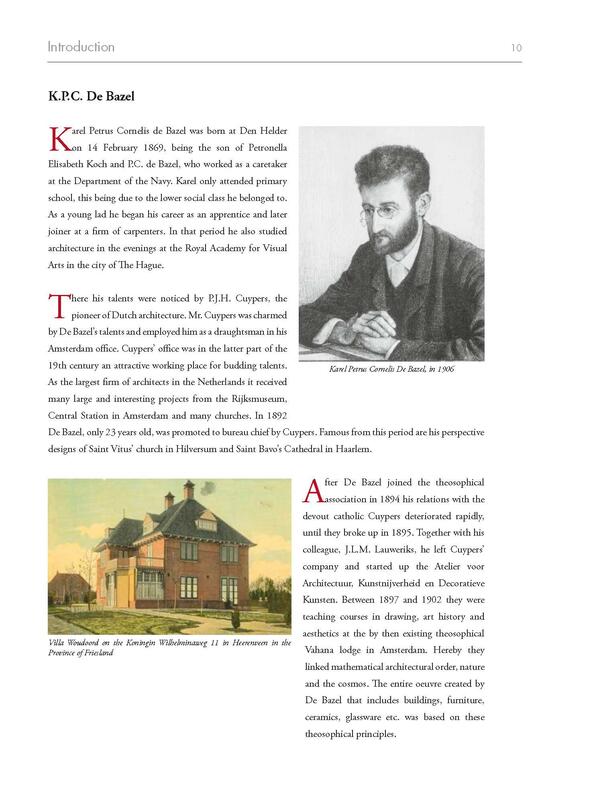 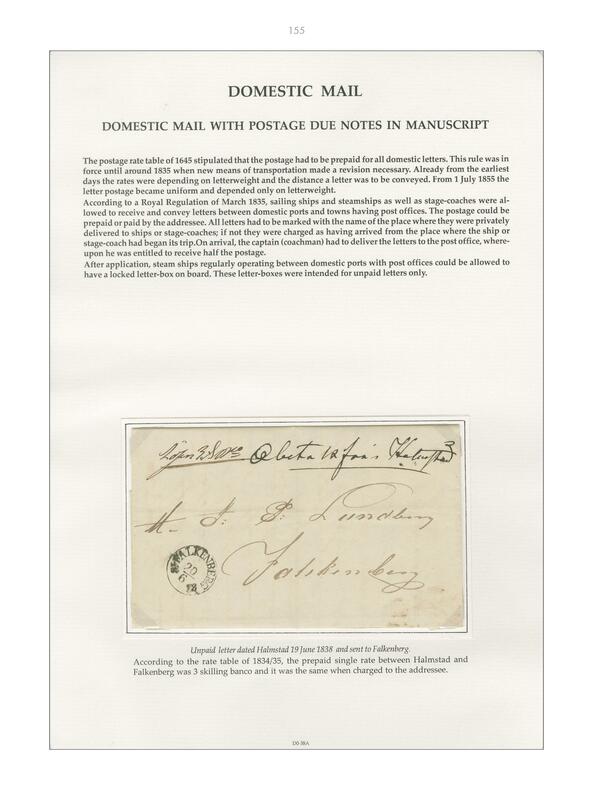 In order to preserve his knowledge which is included in the extensive descriptions of his collection for future "Oldenburg"-collectors he stipulated not only that his collection should go back into the philatelic cacle, but also a book should be published of it. 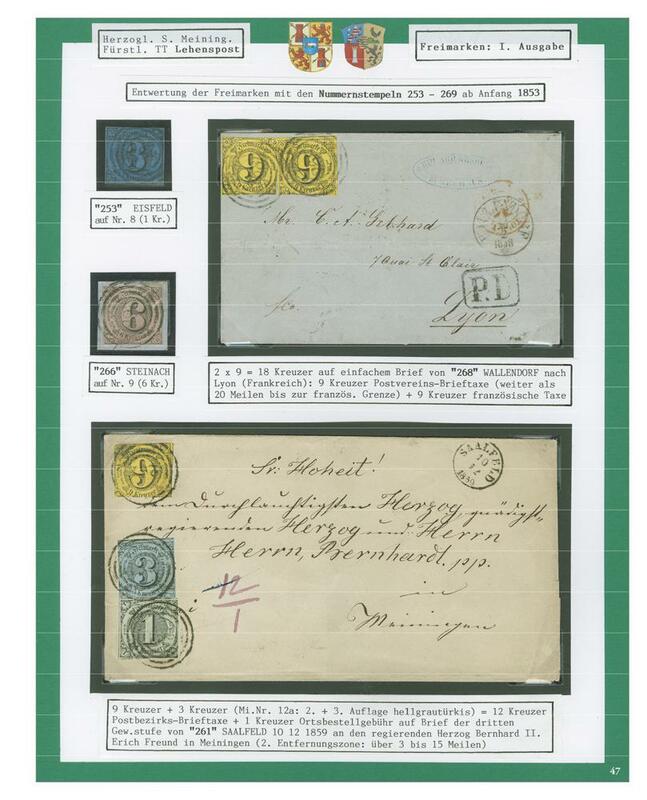 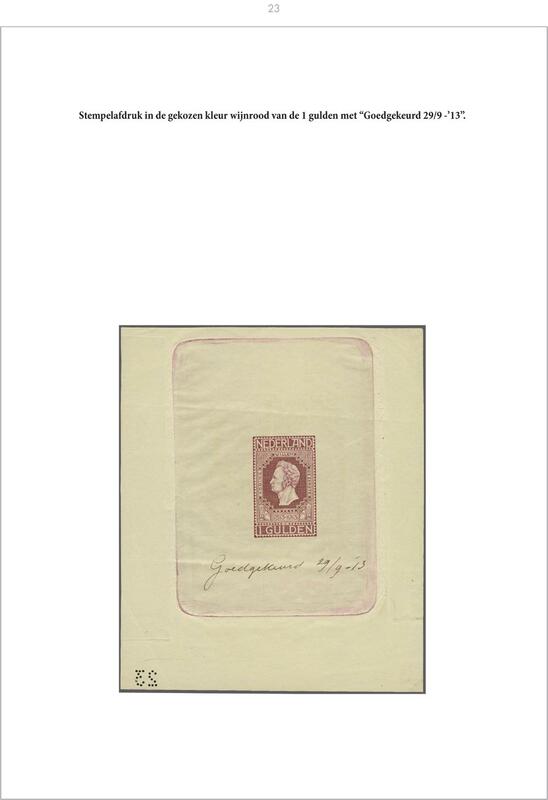 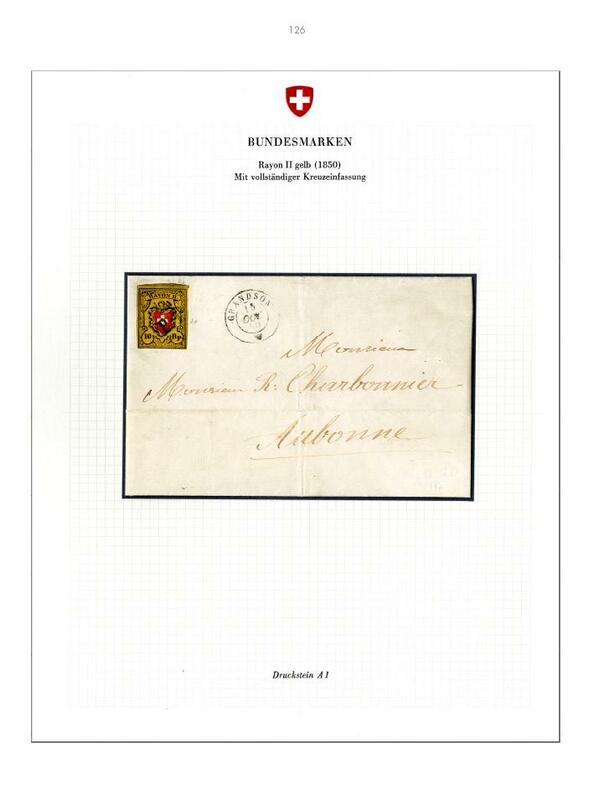 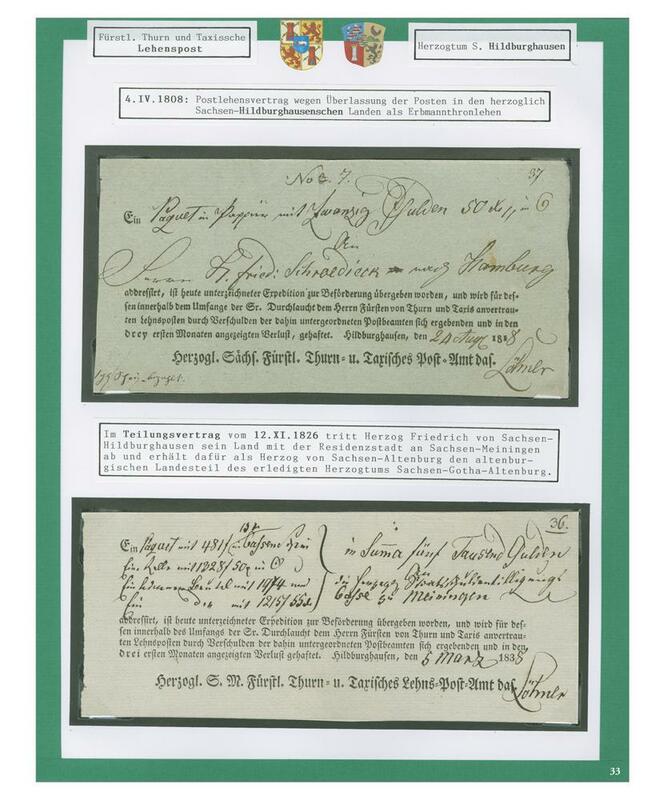 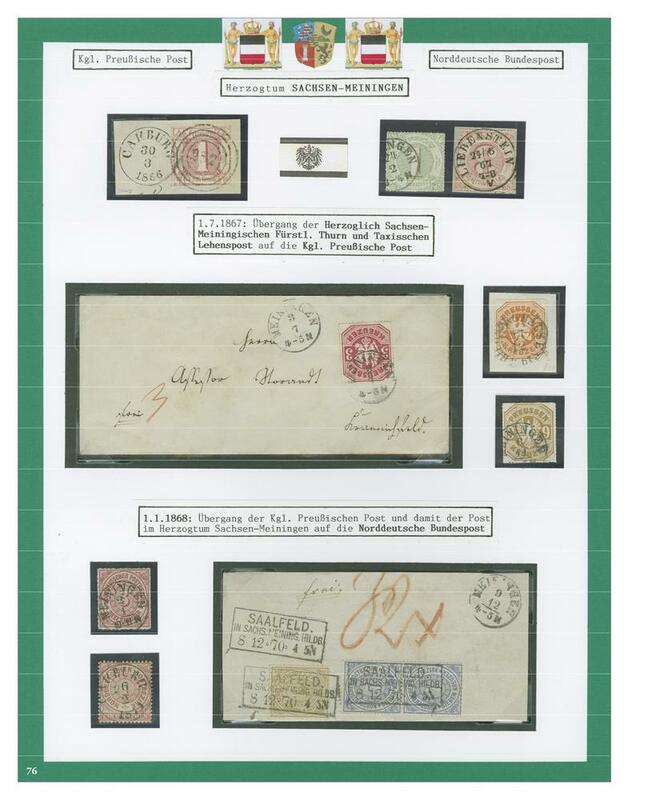 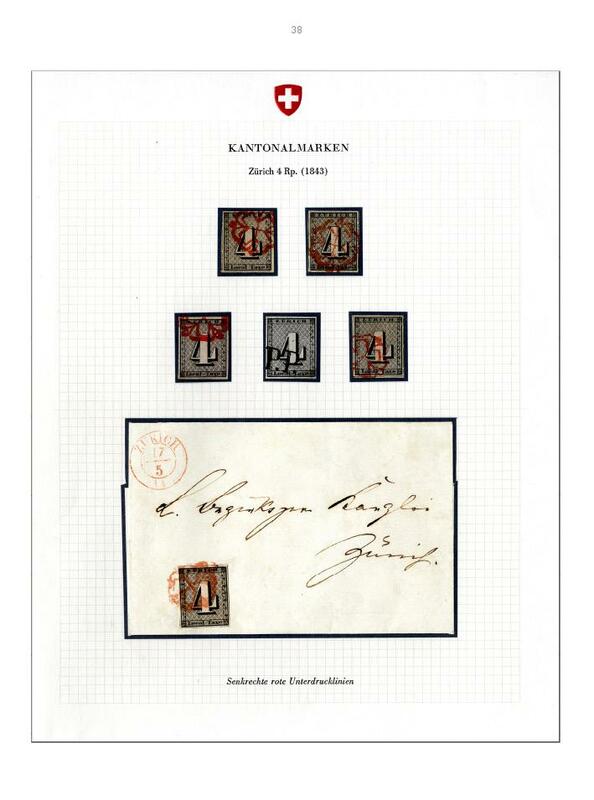 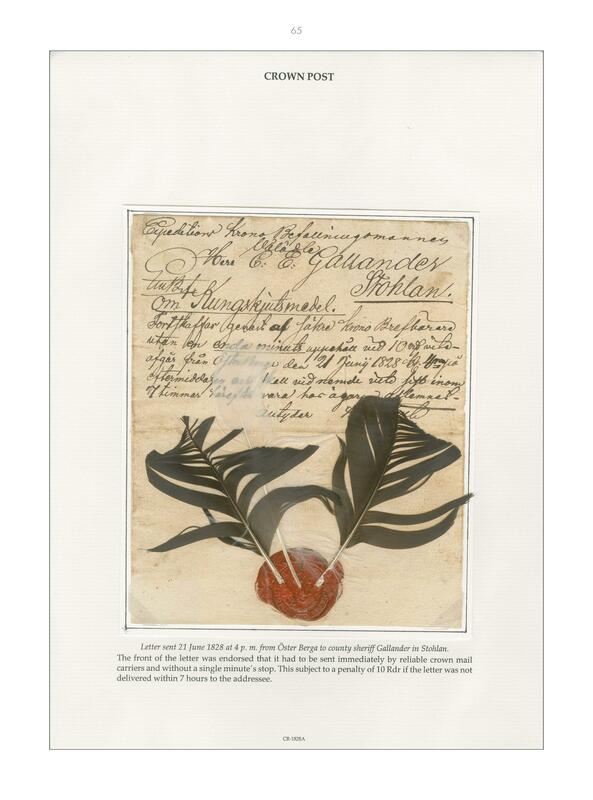 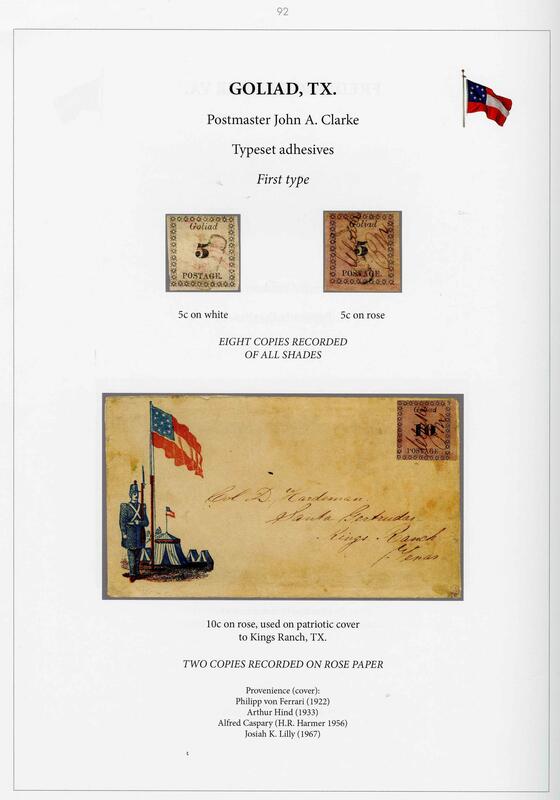 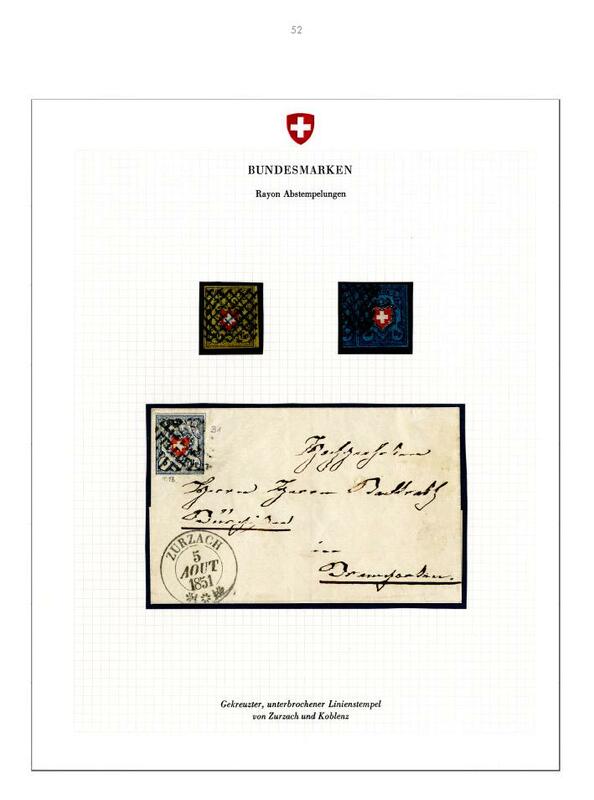 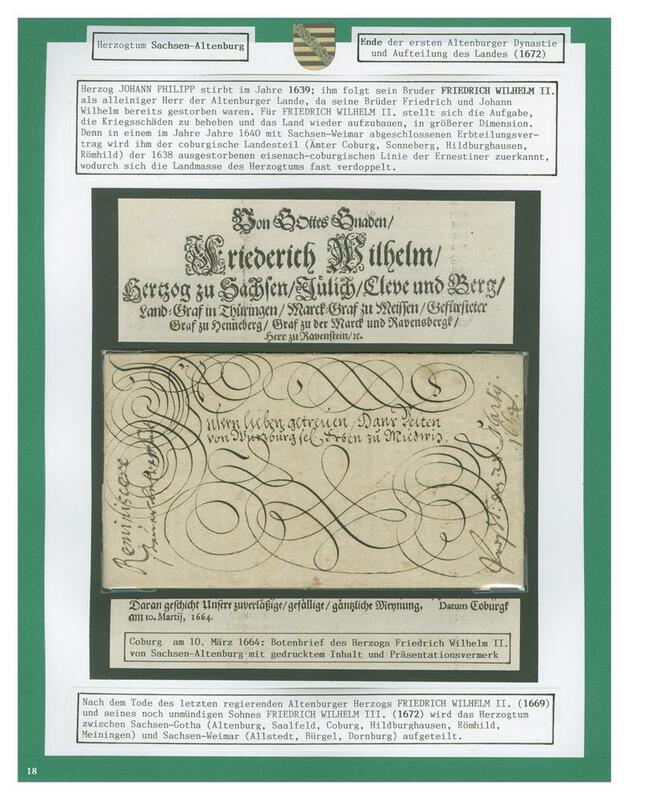 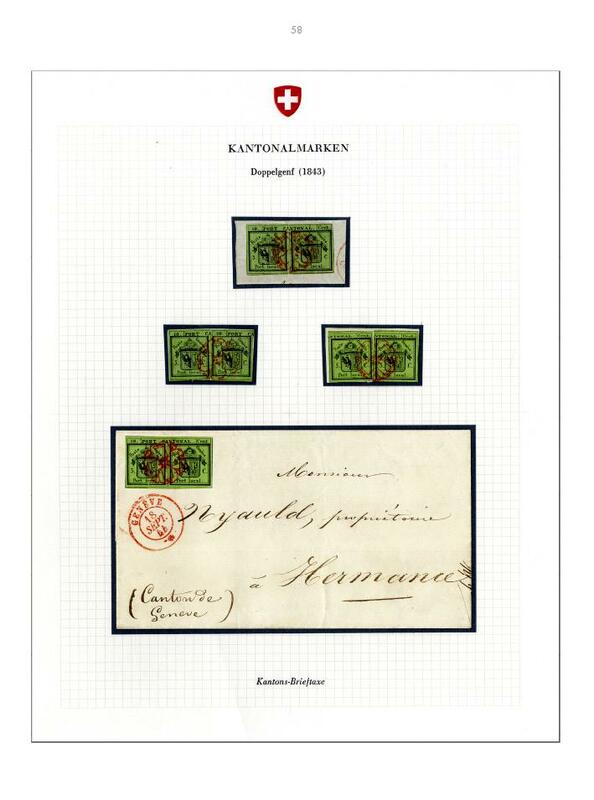 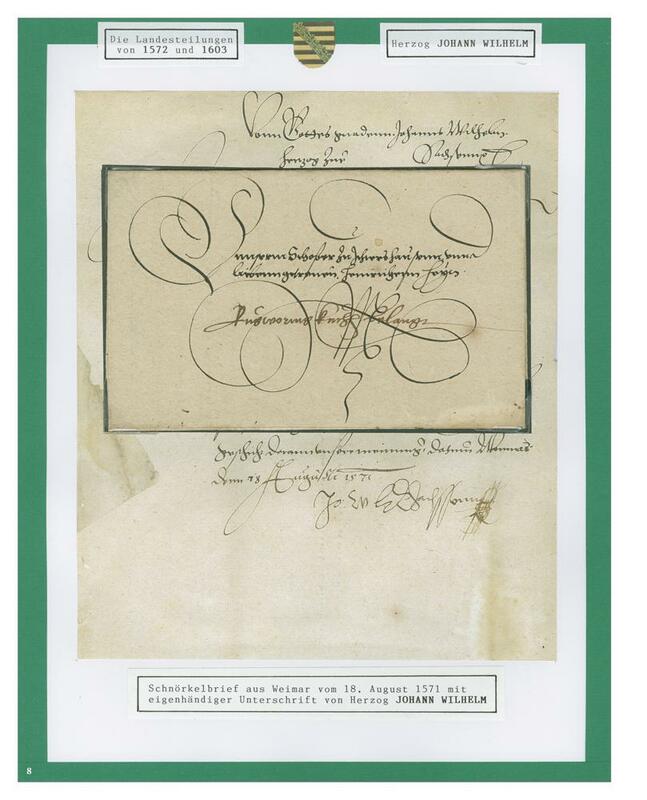 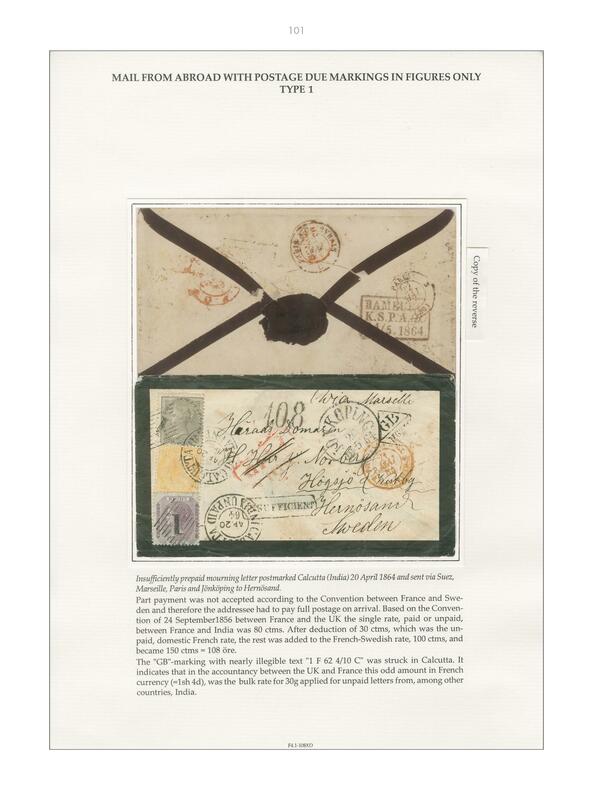 At the same time of the release of the book "Oldenburg" - from pre-philately until the end of the postal authority" the collection was auctioned during the 362nd Heinrich Koehler auction on March 18, 2016 in Wiesbaden.